summary: Trip of a lifetime! 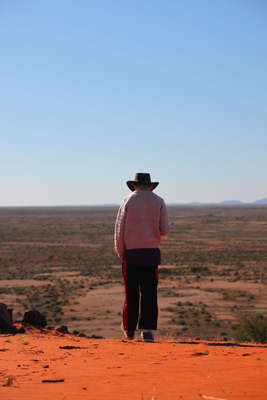 Through the heart of this country, Flinders Ranges, Oodnadatta track, Simpson Desert, etc. etc. people: Graham, Sarah and Jack. Red and Gavin. UPDATE: November 12th 2014 - Finally a full video record, scroll to the bottom to see the whole trip on YouTube. Another big trip ready to depart, and another day packing up the car in the rain! 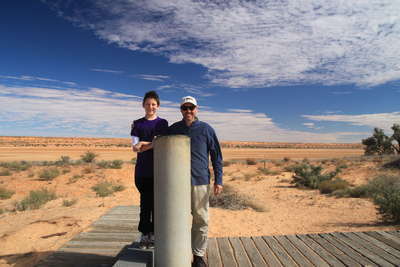 Fortunately I was pretty confident that once we got closer to the desert, the chance of rain would reduce considerably! 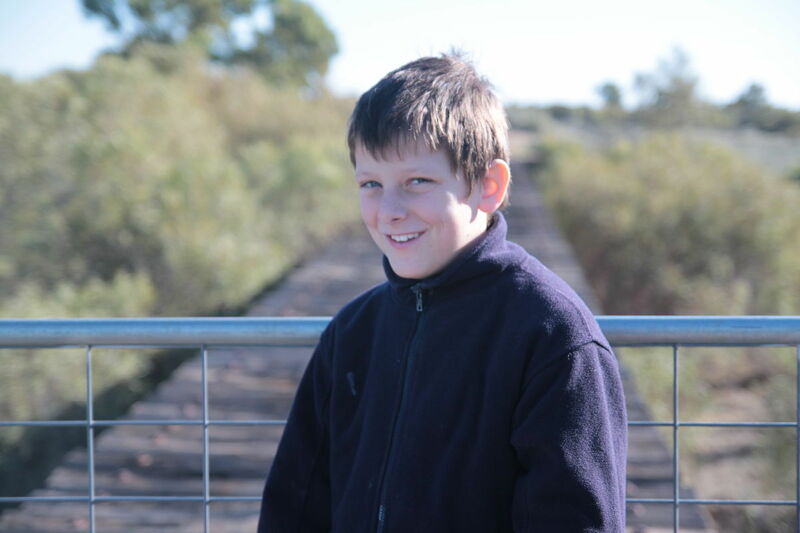 We left home in the afternoon after finishing work and school and headed for Griffith. The rain was on and off most of the drive, and of course when we got to Griffith it was back on again. We arrived at 8:30pm, which was right on schedule. The next day we were up early and ready for another long drive. 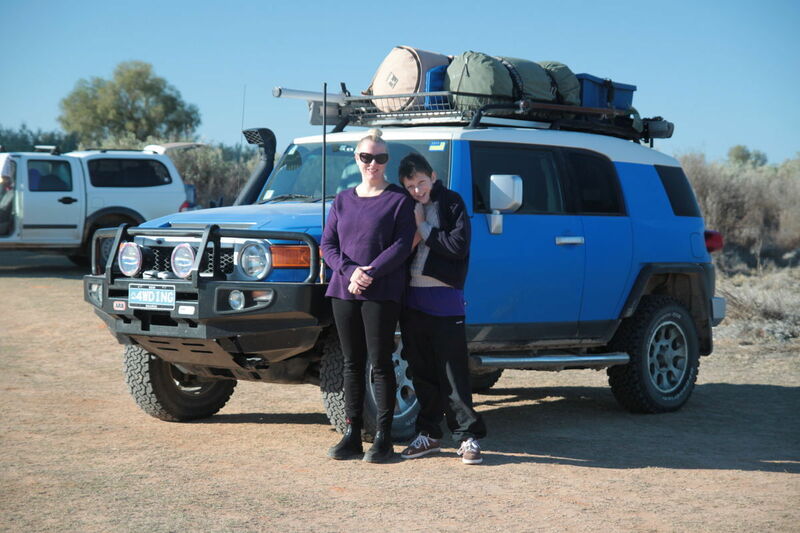 Today we were hoping to head up to Menindee Lakes for our first night of camping, but unfortunately the recent rain meant that a number of the tracks we needed to take were closed to traffic. 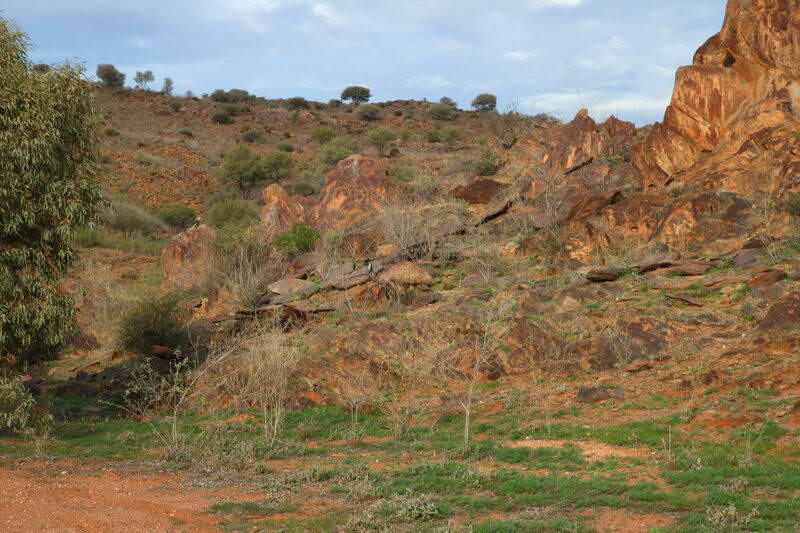 So we needed to use our Plan B, and that was to keep to the black stuff and headed north towards Cobar. 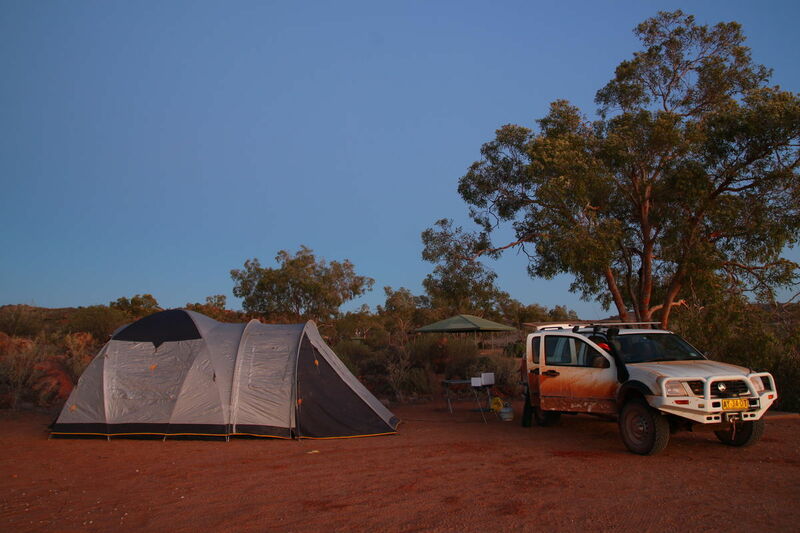 We arrived there early afternoon, but since there wasnt much between Cobar and Broken Hill, we decided that we would call this home for tonight. Coincidently, we happened to bump into Red and Gavin here! 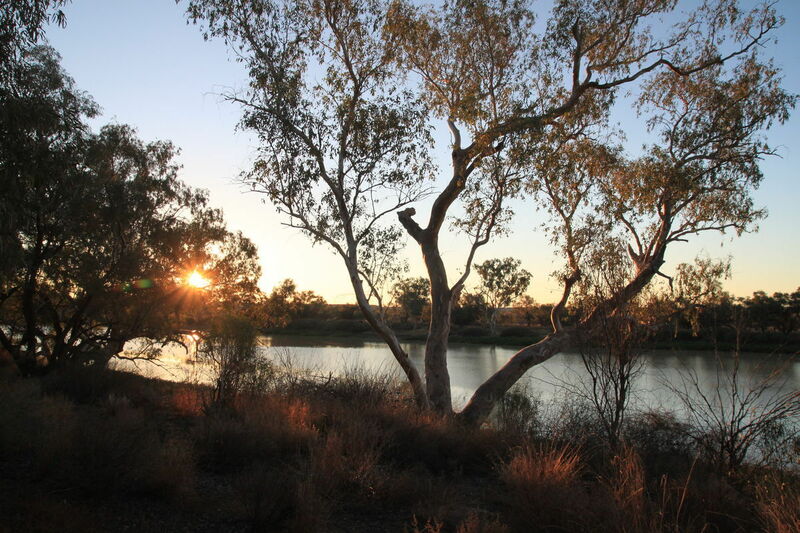 They had been travelling a different route and we were planning on meeting up at Menindee tonight. 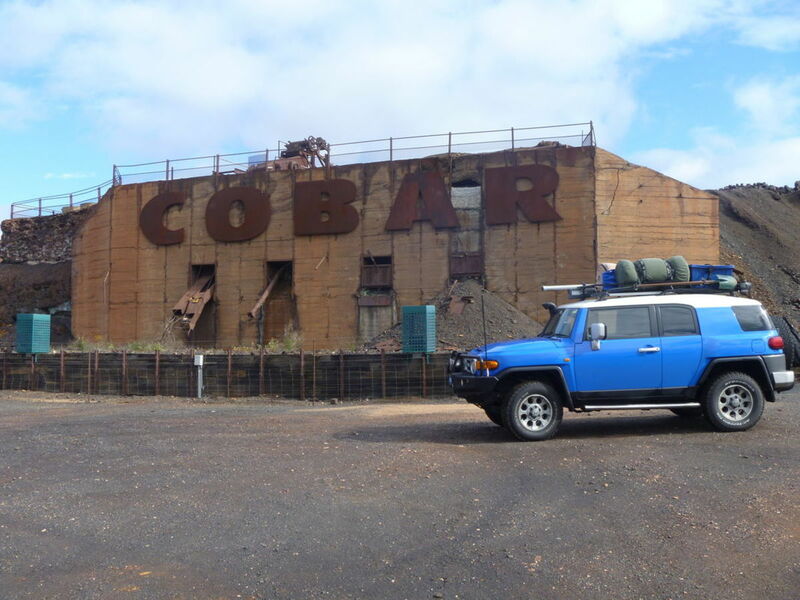 With time on our hands, we explored Cobar a bit and found some great things to see here. And the most impressive was one of the open cut mines that we got to see in action. Then we got to spend the evening together as a group and get ready for the adventures to come. 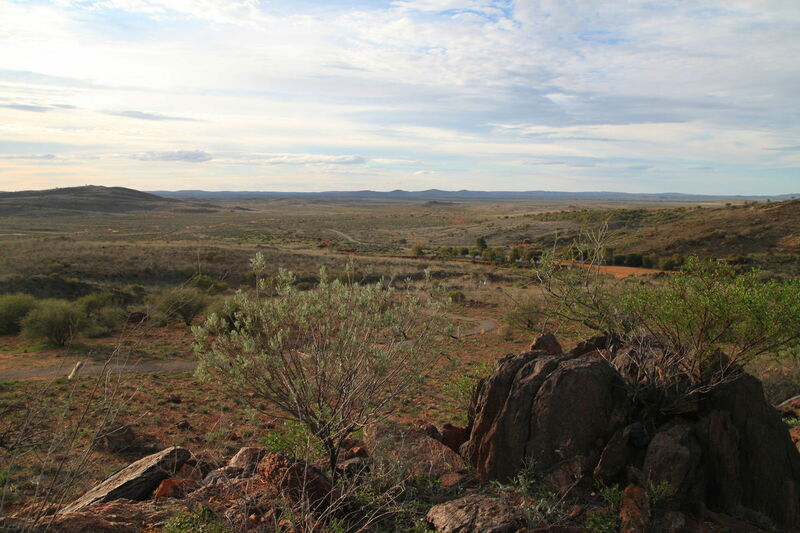 Finally the weather was looking better, and with the sun shining brightly, we left Cobar and headed West. 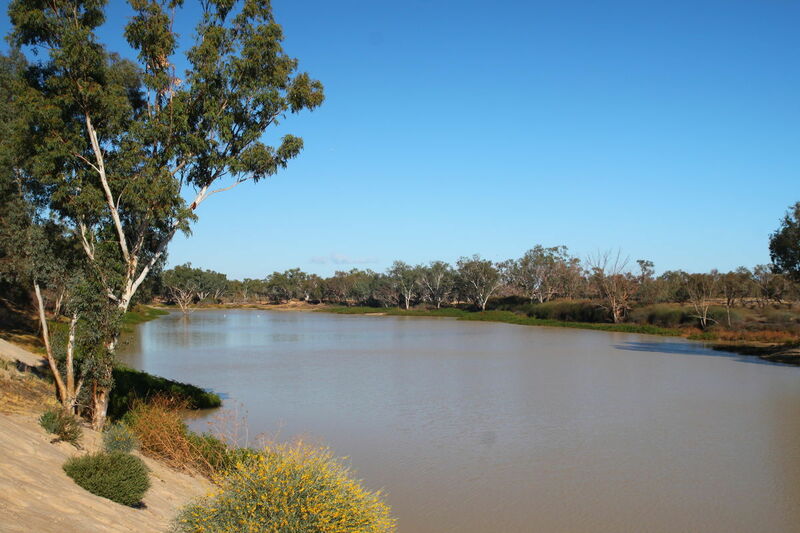 The drive to Broken Hill was going to be a good six hours, and right in the middle is the lovely town of Wilcannia. We pulled over here for lunch around midday. Honestly, there was not much here to see so as soon as we were finished eating we hit the road again. 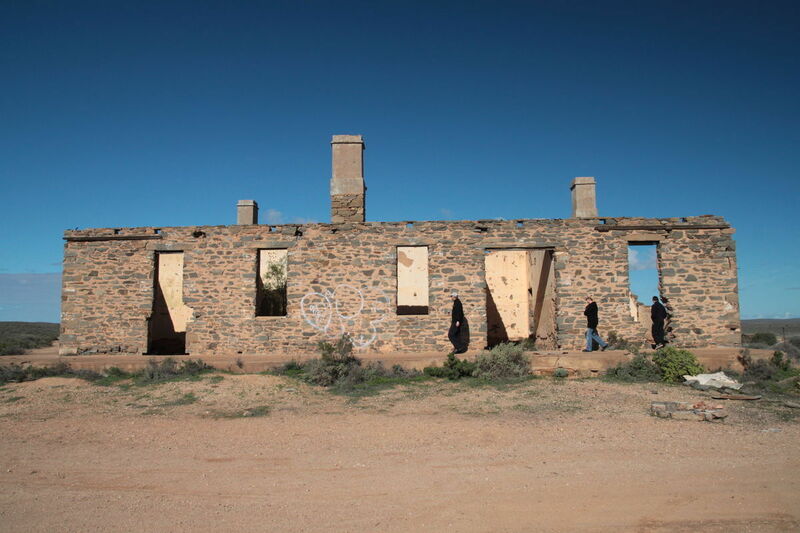 We reached Broken Hill just before three in the afternoon so once again we had plenty of time to stretch the legs and settle into our final motel room for the next couple of weeks. We were all staying at The Lodge Outback Motel, which is a beautiful old motel which was very comfortable and friendly. In the afternoon we drove around a little and then stocked up on supplies ready for the next part of our journey. And of course in the evening, we stocked up on carbs at a local restaurant with some beautiful food! Today would be the first real chance to get the cars off-road. However, we had some serious distance on the agenda for the day! 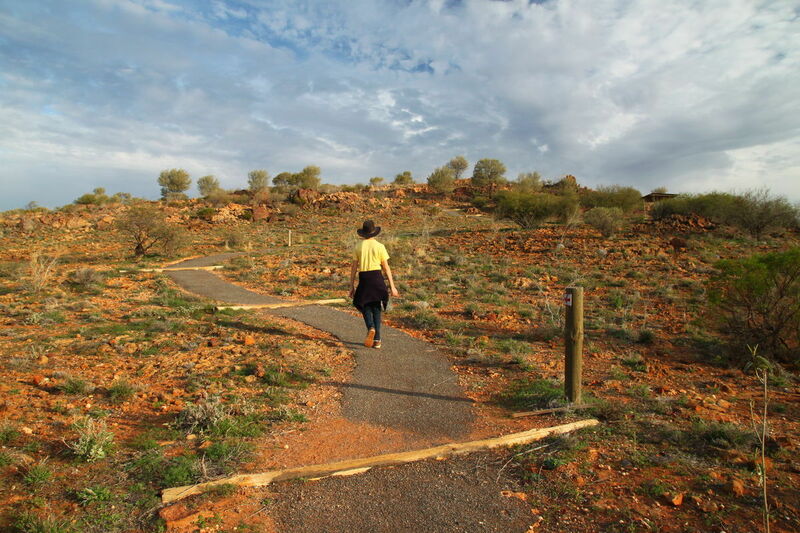 We start off heading West again along the Barrier Highway. 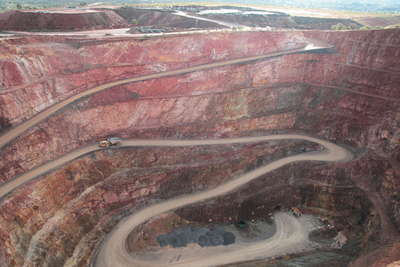 This road goes for as far as the eye can see, and it is full of trucks. 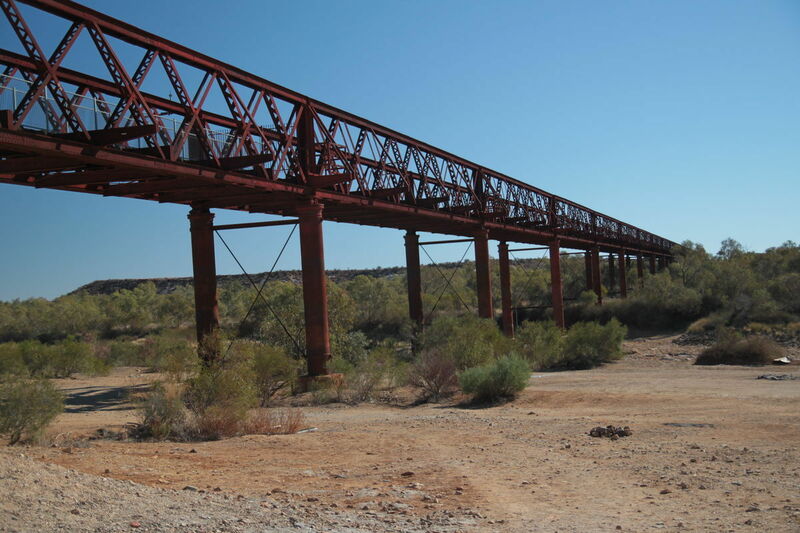 This is the main highway for heavy vehicles travelling West/East across central Australia. 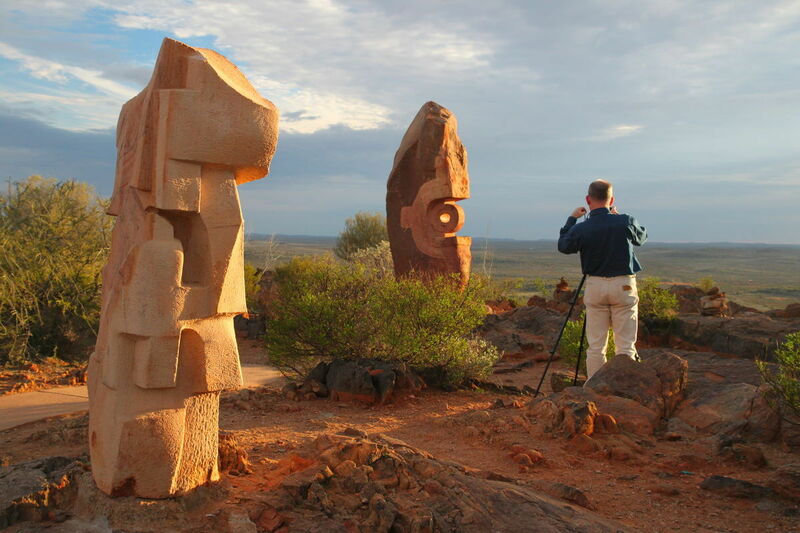 Soon after leaving Broken Hill, we cross the border into South Australia. To confuse things in the convoy, we entered a different time zone. We pass through the small town of Olary, which is not much more than a pub and public toilet block. 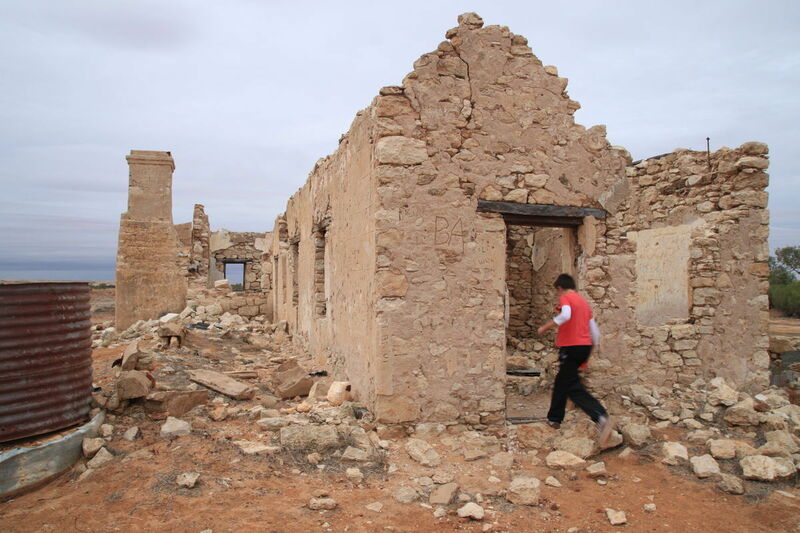 There are a few old ruins to explore, but we move on quickly to Yunta which is another hour down the road. 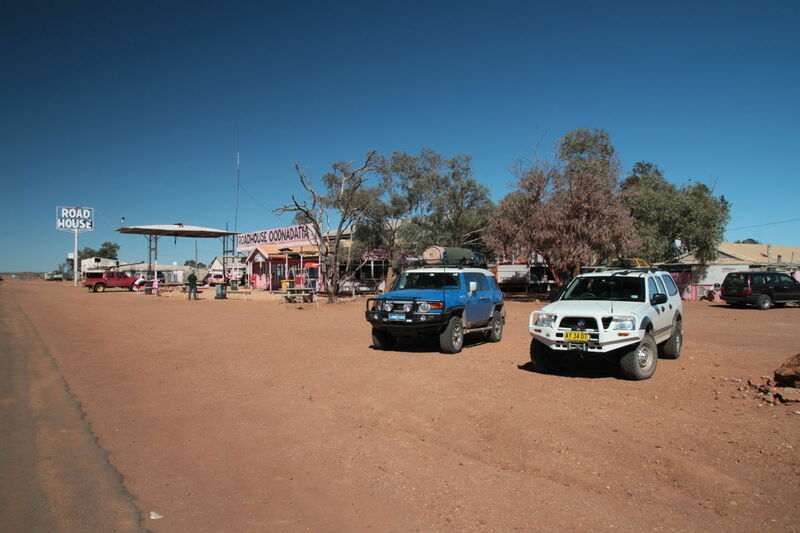 Yunta is the place to stop for fuel, before heading North out along Arkaroola road which marks the start of our off-road adventure! 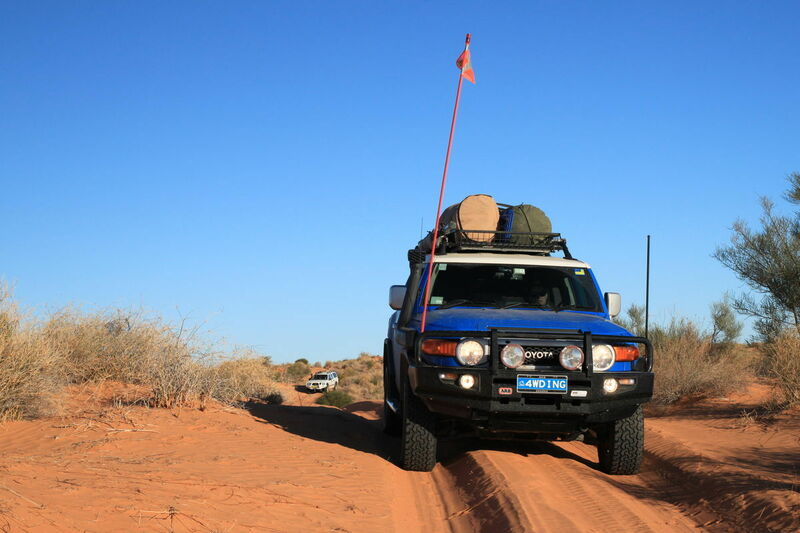 We let some air out of the tyres and then head North towards our next stop at the ruins of Waukaringa, and old town that has long been forgotten by most. 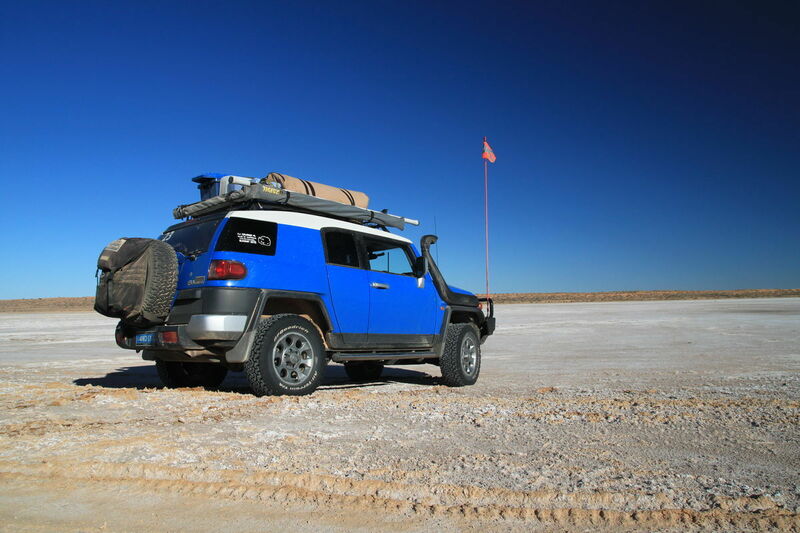 It was actually my camp spot when I came through here in 2012 on the inaugural Australian FJ Cruiser Summit. 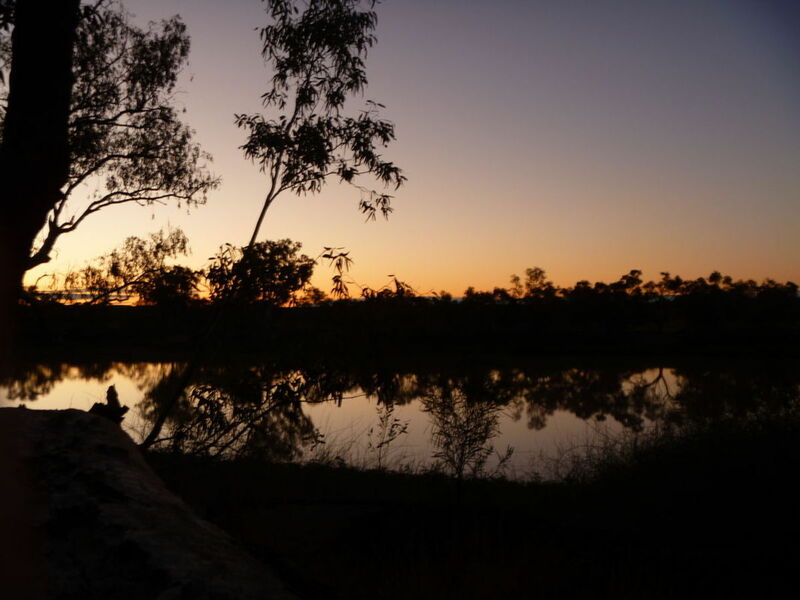 After taking a break at Waukaringa, we hit the road again for the long drive up to The Gammon Ranges and our final destination for the day, Chambers Gorge. 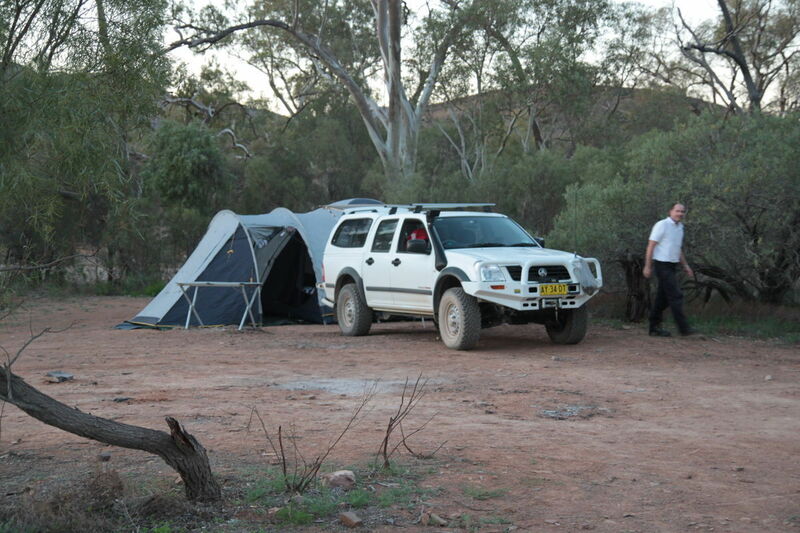 We arrived at Chambers Gorge just after three thirty. 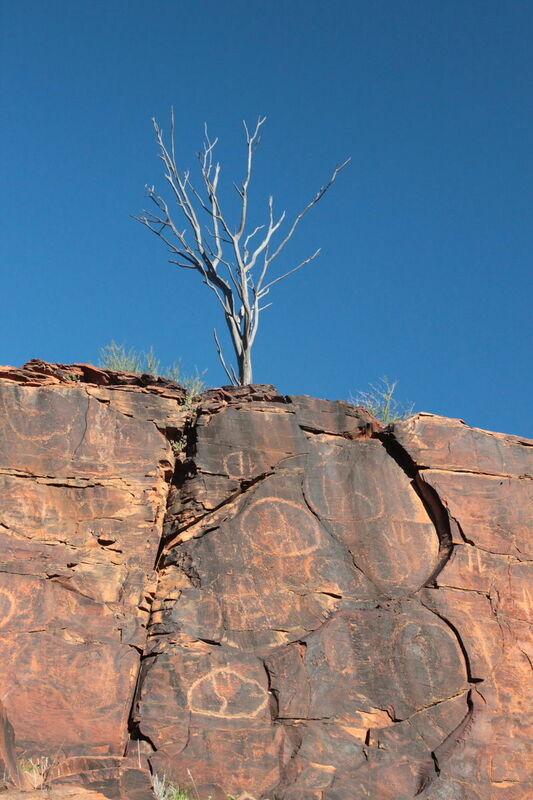 Its an amazing place with a lot of Aboriginal significance. There are several camping areas available, and we selected one that kept us away from most of the riff-raff that was arriving (GDT tour group were right behind us ;). However, our location was not far enough away from the caravan across the creek bed that decided country music went well with our country setting! We settled in quite early for our first official night of camping on the road. We had plenty of time in the morning to do some investigating around the gorge. 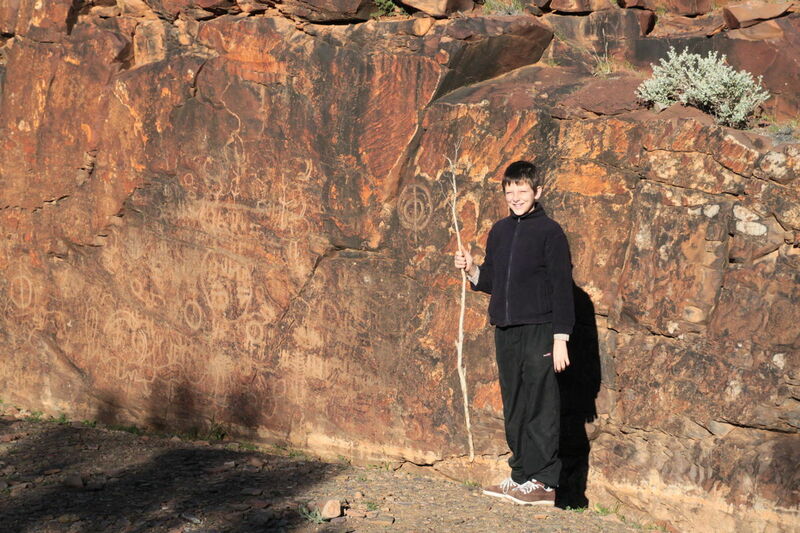 There is a walking track that takes you down the main valley to some amazing Aboriginal carvings on the walls of the gorge. You need to keep walking right to the end of the trail before you find them, buts its definitely worth it. 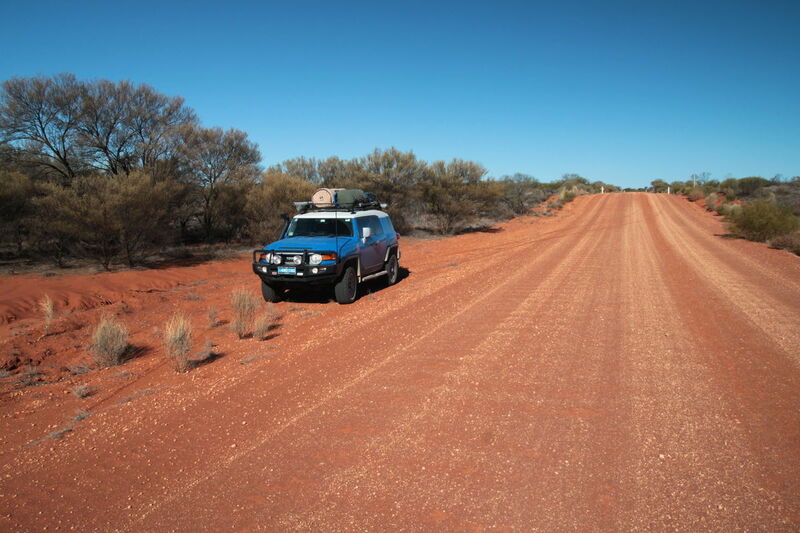 Unfortunately, the road out of Copley was back to bitumen again, but not for too long. 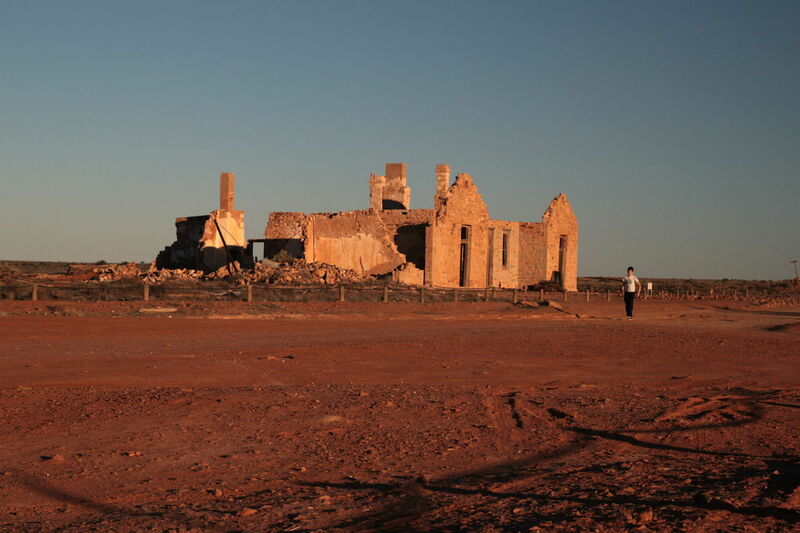 It did mean that the last leg for the day was completed quickly, reaching the old ruined town of Farina after about an hour of driving. 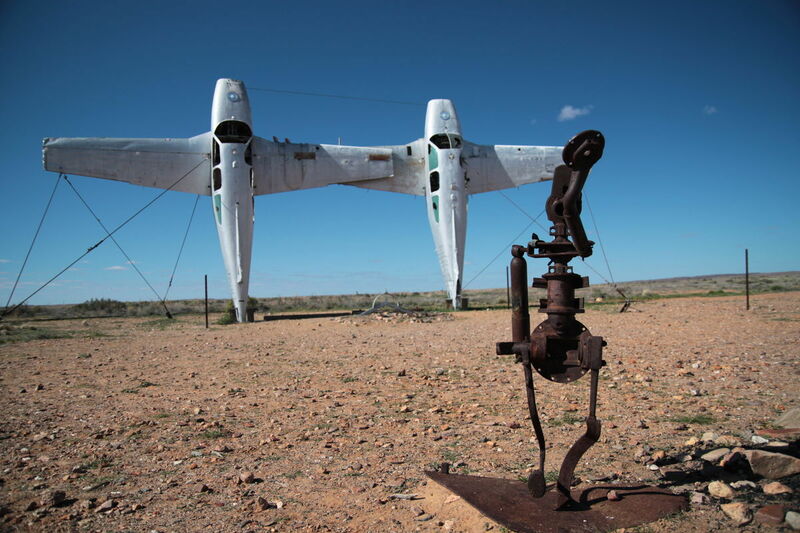 Farina is another of these old country towns that since their demise, have been slowly returning back to nature. 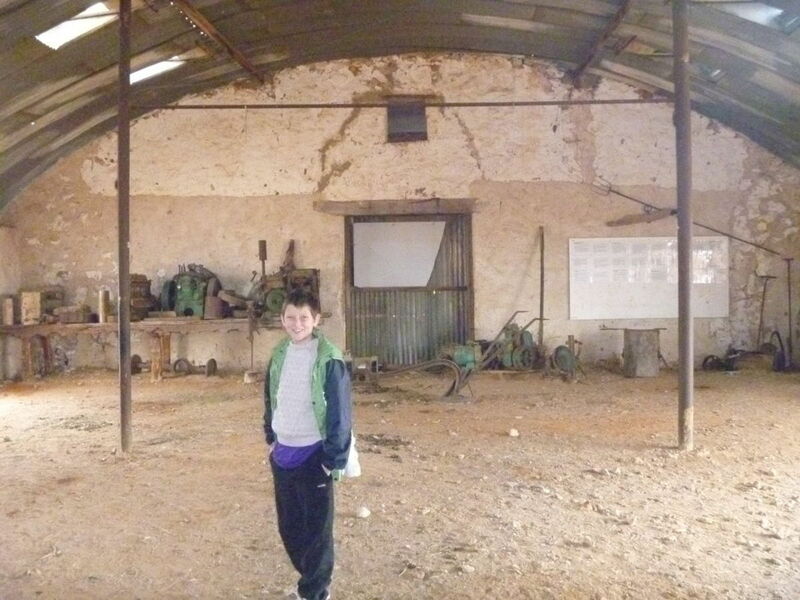 There were once again many artefacts and things to investigate, along with a large information board giving us the whole history of the town. The camping area at Farina is excellent, although a little busy. They even have showers!! Of course you need to provide your own water and fire wood to heat it ;) But this is were things turned a little sour for us. There were signs as you came in to collect firewood from the farm house, so Red an I went off looking for it...Unfortunately we didnt find too many friendly places that looked like they might give us what we were after! So tonight, we would be fireless. As it turned out, tonight was the one night we really needed that fire with the temperatures dropping dramatically once the sun went down! Needless to say, it was a nice early night to bed. We rose to a very fresh morning, brushing a little frost from the swags before doing a last pass over the town of Farina. We found an old railway bridge for Jack, before hitting the road again. 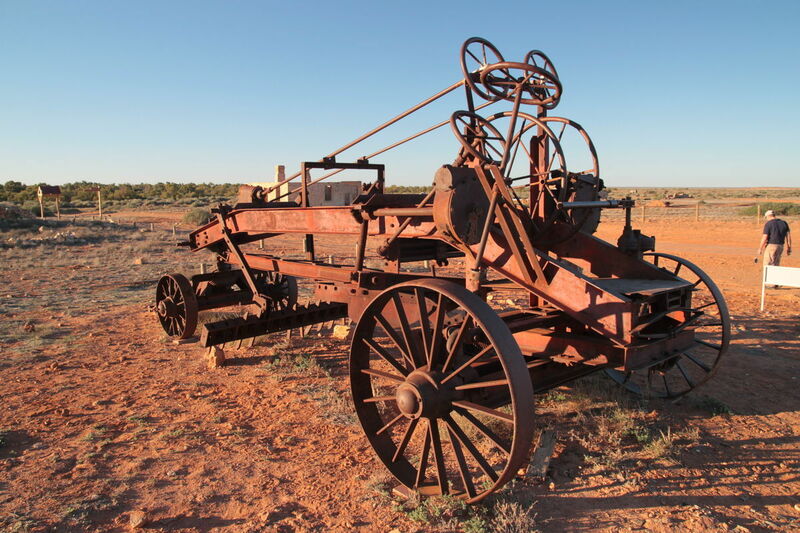 Our drive today is along the infamous Oodnadatta Track. This road has been around for a long time, and lucky for us has been quite well maintained. Even so, it did try to shake loose anything that wasnt well tied down! Our first stop was the town of Maree, which is an hour down the road. 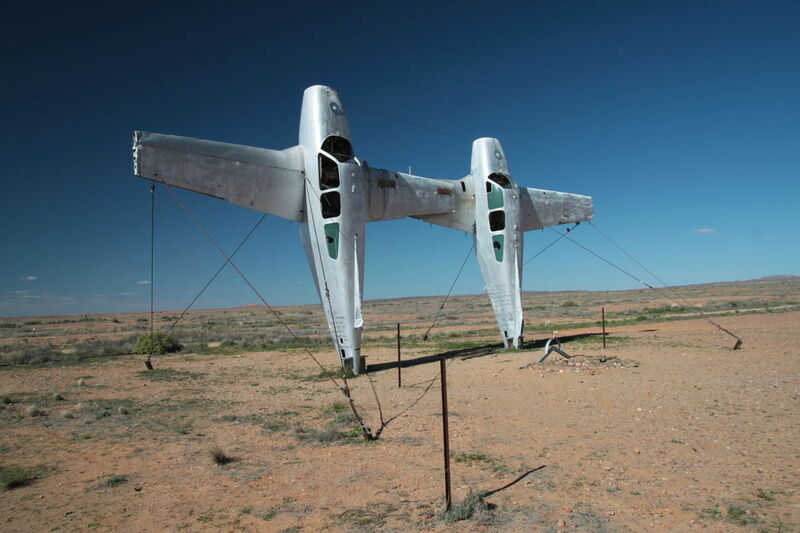 Maree is actually quite a big town and is one of the launching spots for joy flights over Lake Eyre. 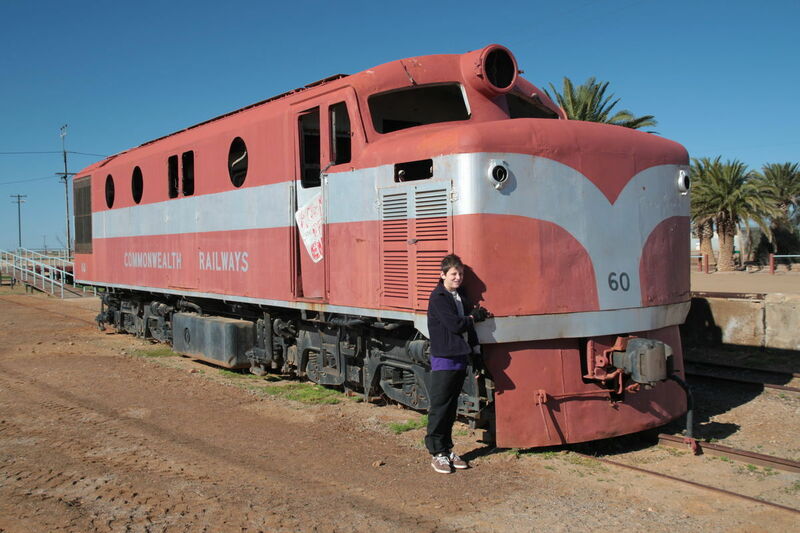 We weren't here for flying today, but there was enough old railway relics here to keep us busy for a while. 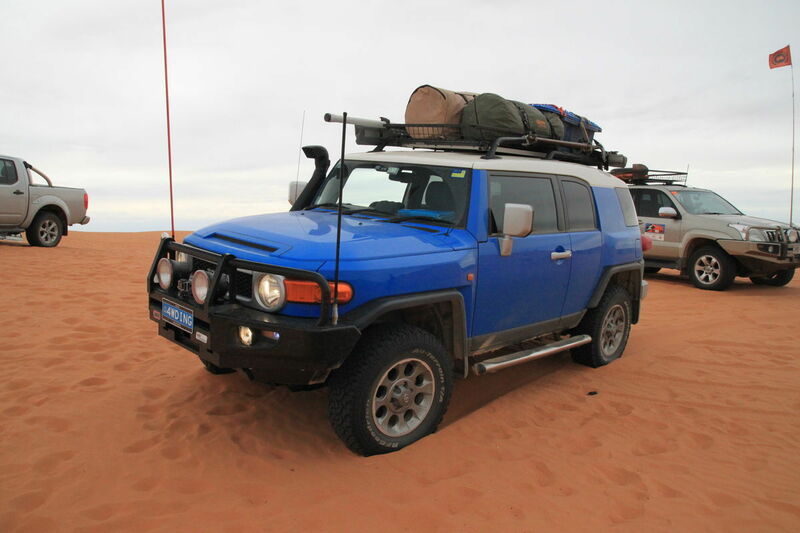 We filled up with fuel once again, and supplies and even saw another FJ Cruiser doing the same! 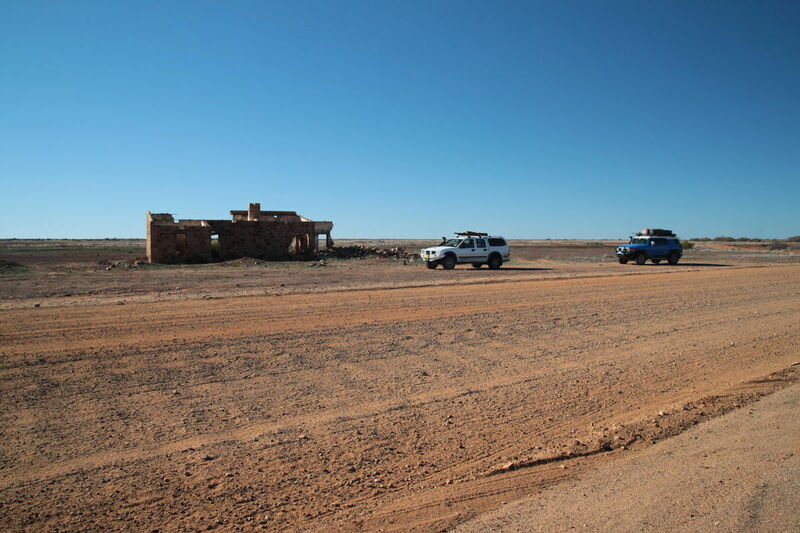 They were also heading through the desert but were planning to follow the French Line and get into Birdsville a day ahead of us (we actually bumped into them again at Poeppels Corner). We continued along the Oodnadatta track towards Lake Eyre. We stopped along the way at a rather interesting display of what can only be described as 'art'. Before continuing on to the Lake for lunch, which actually had water in it! 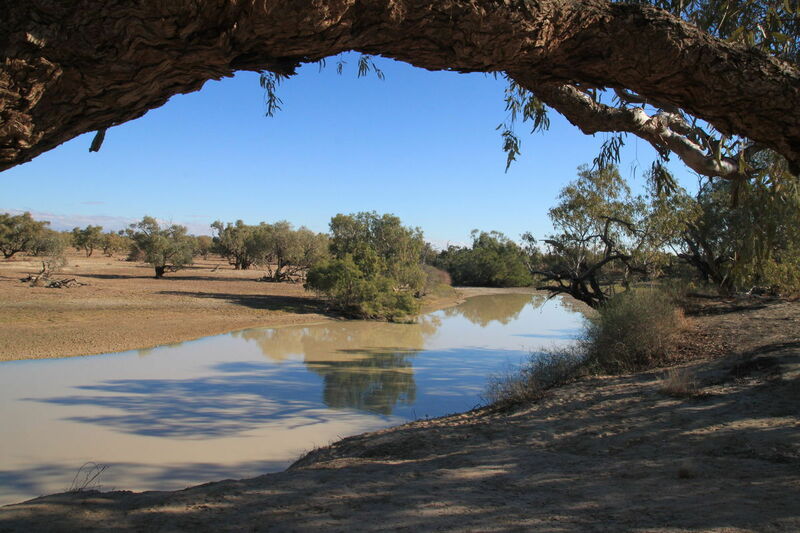 After lunch we continued North West towards William Creek, but half an hour down the rad we had another short detour to check out The Blanche Cup and The Bubbler which are natural springs created from water deep within the Great Artesian Basin. 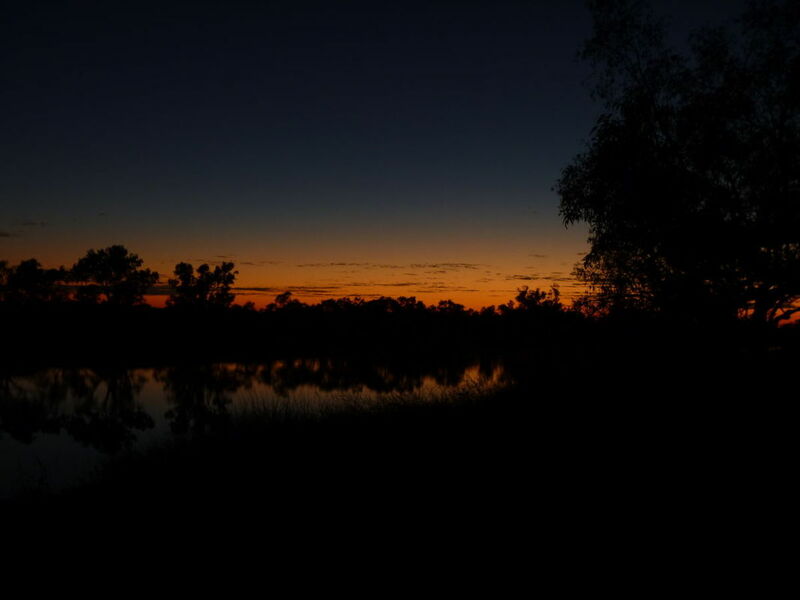 These natural wonders are part of the Wabma Kadarbu Mound Springs Conservation Park and well worth a visit. 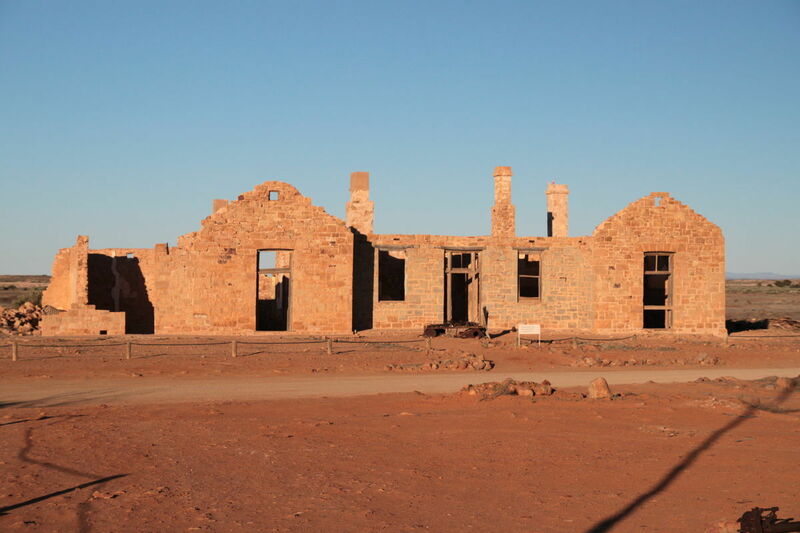 We did find a small set of ruins before we got to Oodnadatta which served us well as a morning tea stop. It was the old ruins of Edward Creek - and by all accounts I'm not surprised it was a ruin. Its pretty extreme country out here, and the wind was howling while we were there. 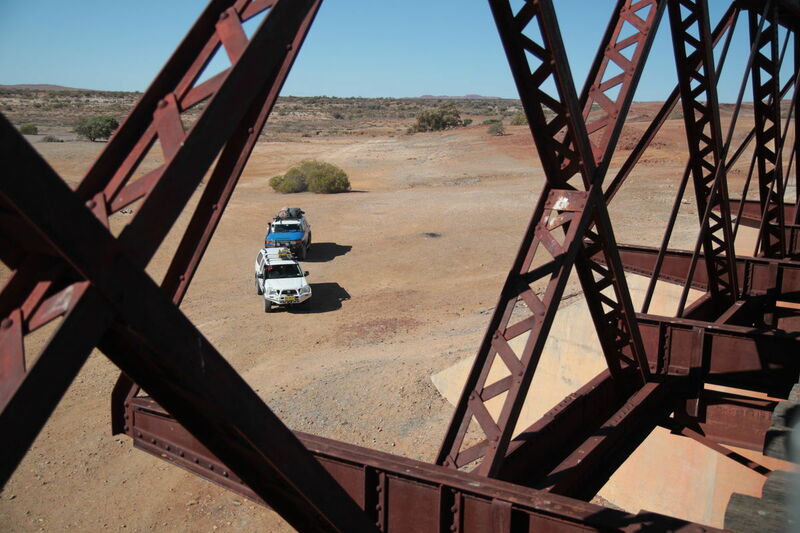 We continued North towards Oodnadatta until we reached Algebuckina, which is the site for one of the longest railway bridges in the country. Its hard to believe that they needed a bridge here since everything was so dry when we were there, but apparently back in the day, this used to be a pretty serious river. 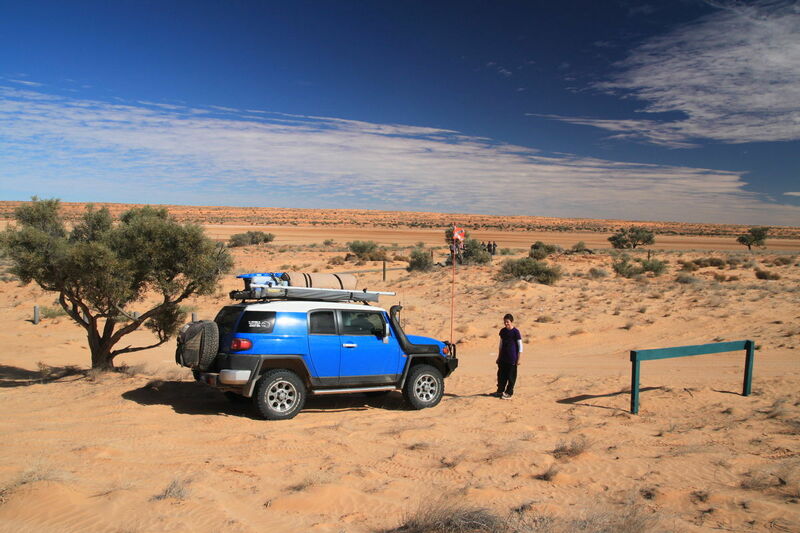 Another half an hour driving and we were finally in Oodnadatta, just in time for lunch. 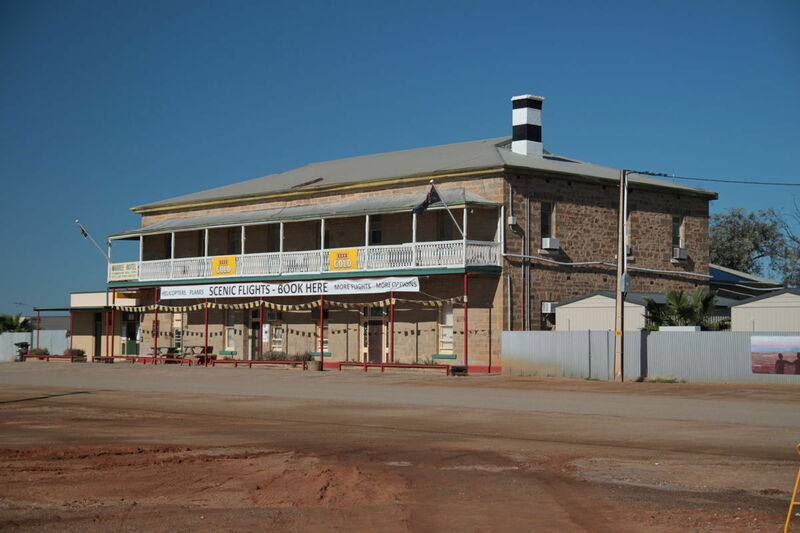 However I would want to be in a hurry when ordering lunch at the infamous "Pink Roadhouse", the service there was not particularly quick. However, the quality of the food could not questioned, it was great. 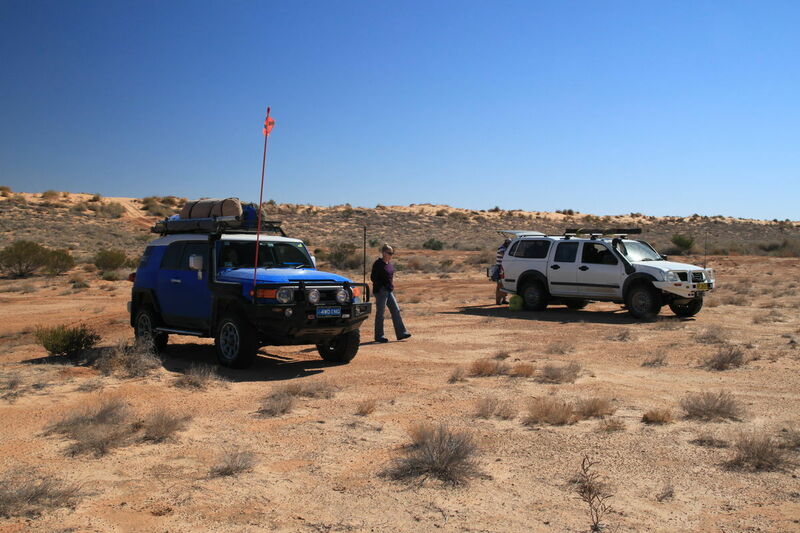 After lunch we continued our trek along the Oodnadatta track to the North, past Mount Sarah and on to the small town of Hamilton before turning off the main road and starting out run to the desert. The road definitely turned rougher at this point, and so the going was pretty slow. 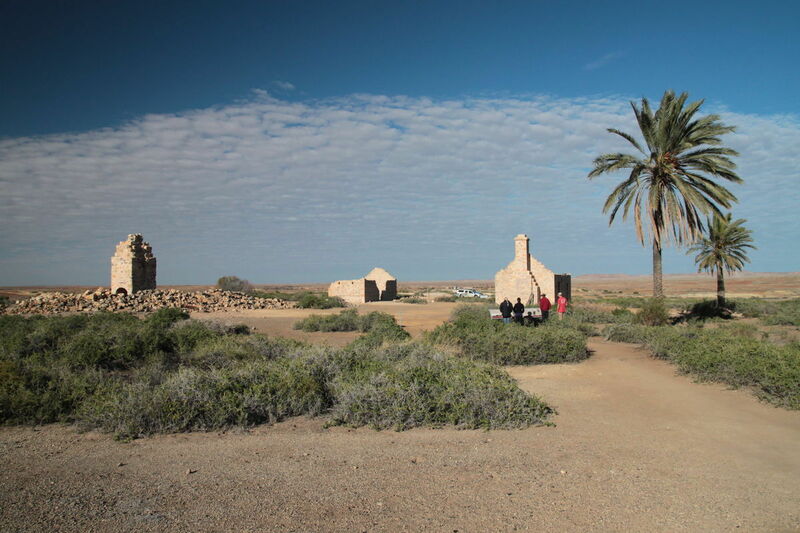 We eventually reached Pedirka Ruins which was supposed to be our camp for the night, but this place was definitely not singing out to us as a bush camp site! 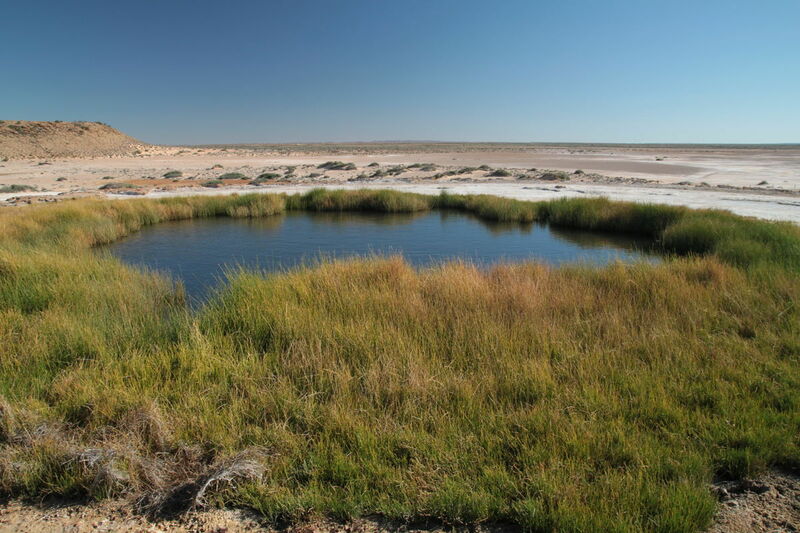 So we continued on towards Dalhousie Springs (the gateway to the desert). As the sun was starting to get lower in the sky we finally found a great little bush camp site a little way short of Dalhousie Ruins. 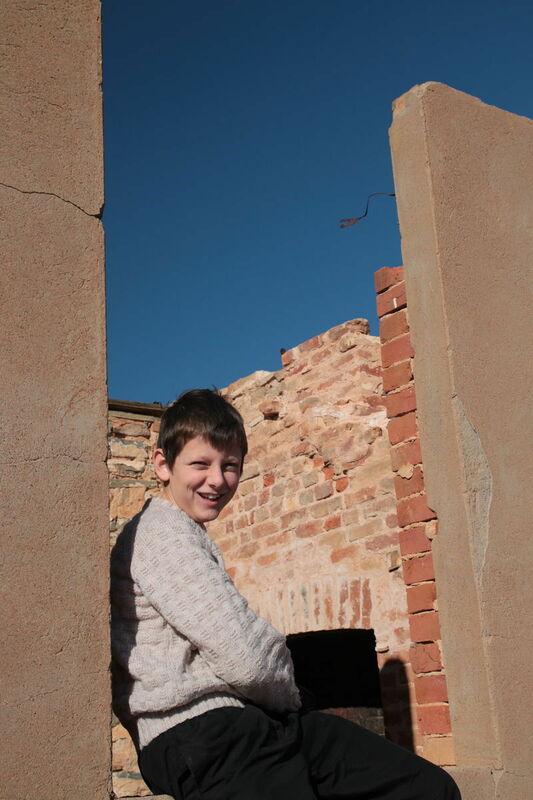 It was a great little spot off the main track and with a vast supply of fire wood for Jack to practice his fire building skills. 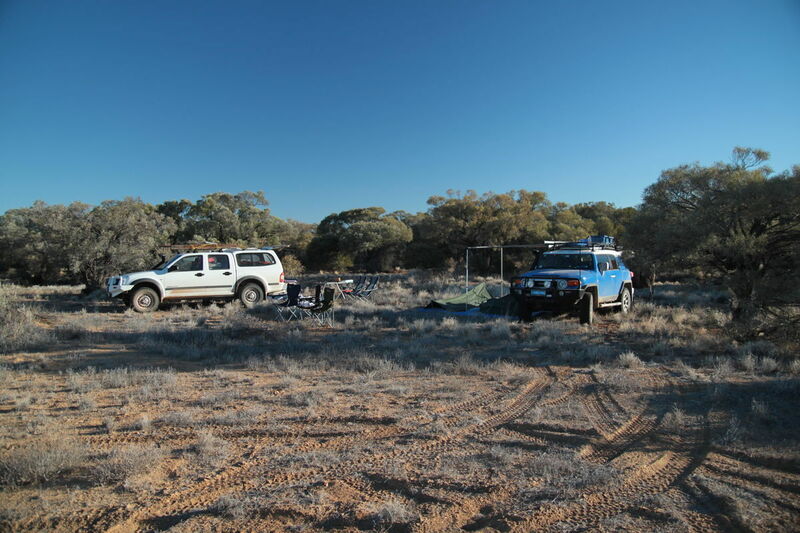 We slowly packed up from our wonderful bush campsite, the last before we hit the desert. Not far down the road we arrive at the oasis of the desert, Dalhousie Ruins. At least this is what the locals thought of it many years ago when they set up their homestead here. Over the years the location has become overgrown with palm trees which have slowly soaked up all the water from the local ground. Still a great spot to stop! 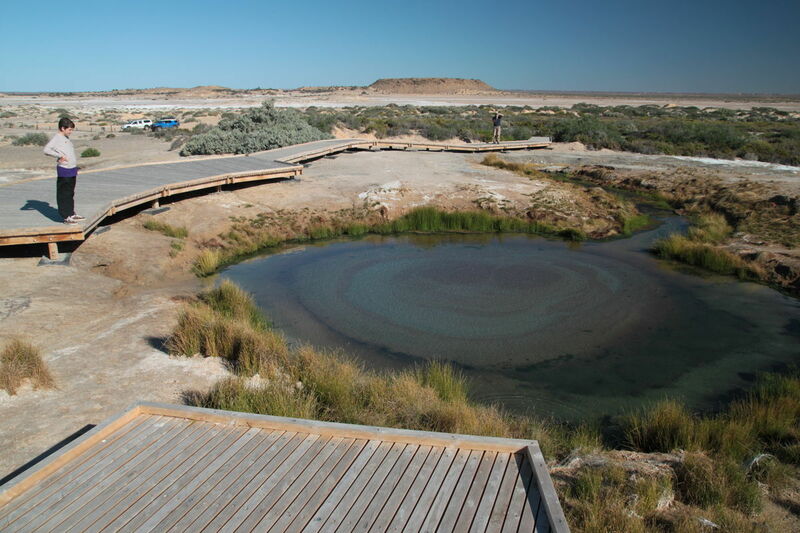 Further on down the trail we find the amazing Dalhousie Springs which is a natural spring area which is ideal for a little swimming - along with everyone else. 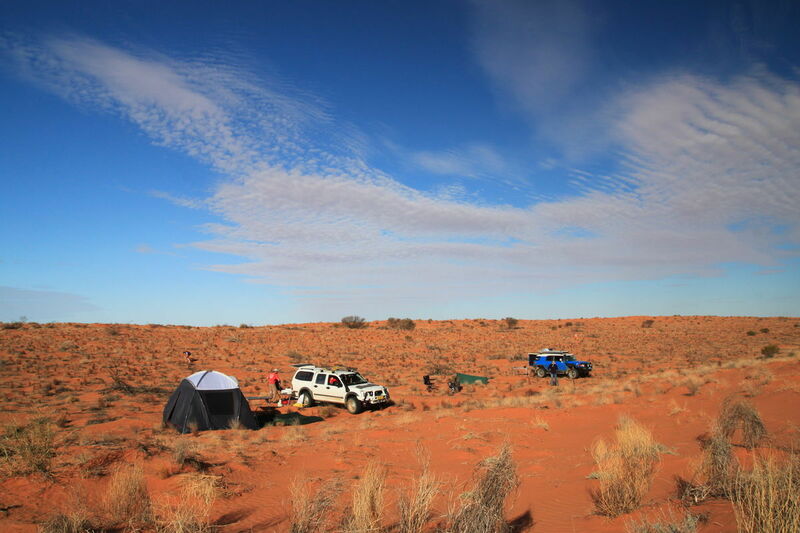 There is also a large camping area here which is a common place for people stopping before entering, or on their way out of the desert. 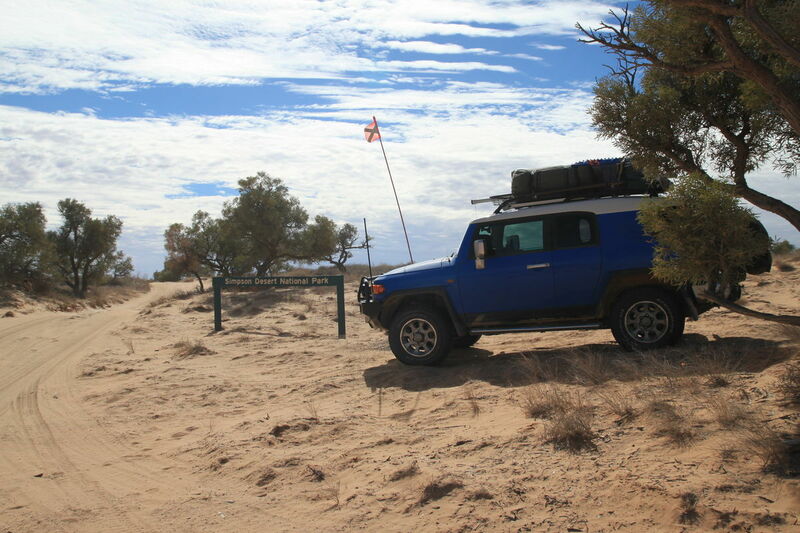 After the obligatory swim and setting up of the sand flag, we set off for the desert. 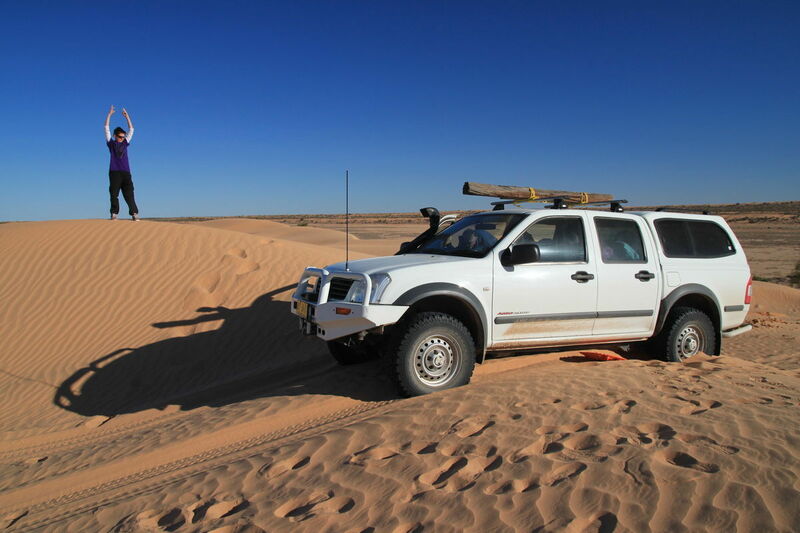 Didn't actually take too long before the track turned sandy, and then the up and down of the dunes signified that we were finally - IN THE DESERT - yes we had already travelled over 2,500kms on this trip and we were only just getting to the desert! Anyway, it was worth every minute getting here. 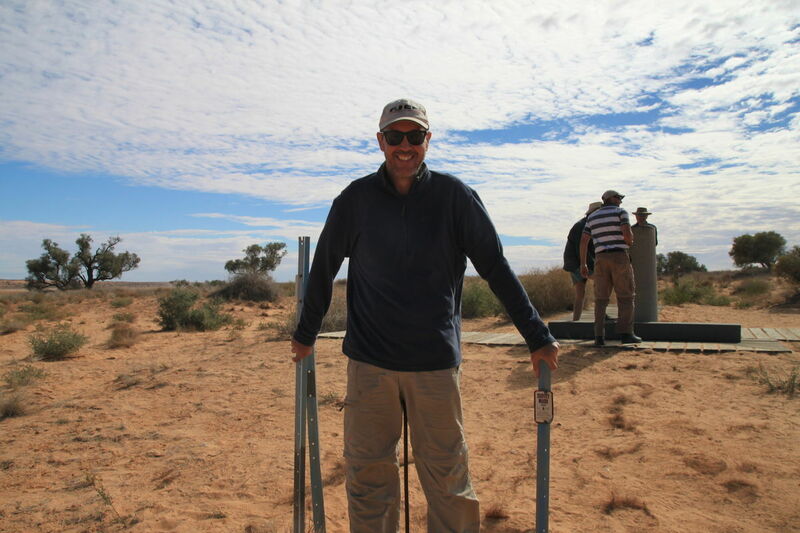 Not much further down the track we arrived at Purni Bore, another artesian basin bore. Last time I was here the bore was open and flowing, but it has apparently been impacting the flow at Dalhousie Springs, so they have turned it right down. It flows just enough to server the local wildlife - and to power the hot shower here! 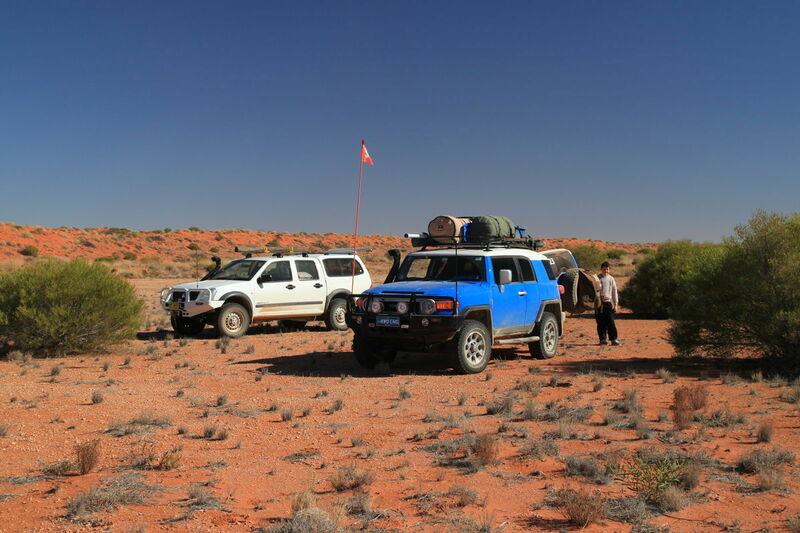 With Purni Bore done, we continued into the vast desolate desert, and soon enough we came across the official start of the desert. It hasn't really started until you find the signs, and here they were! Photo opportunity and the good lucks were passed around before heading over the next dune. 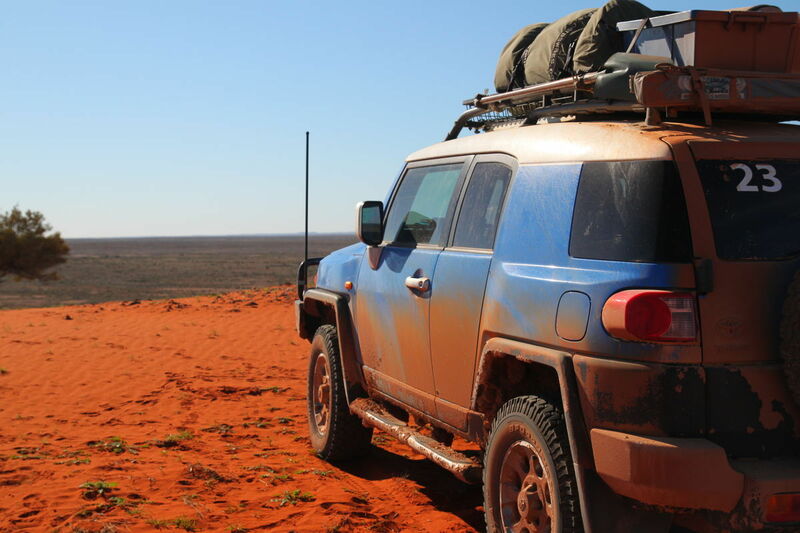 Driving in the desert is typically quite slow, and with the numerous stops we had today, this was the lowest number of kilometres travelled so far - but it was still getting late. 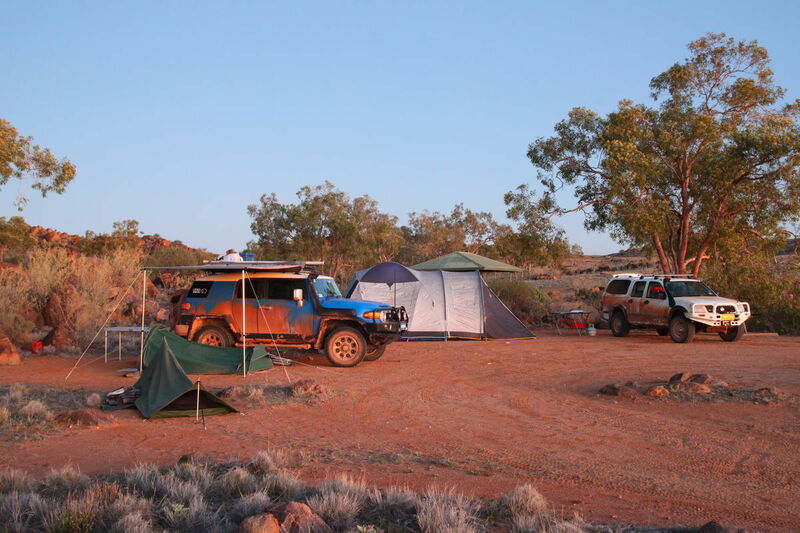 Fortunately once you are in the desert, you are spoilt for choice when it comes to camping. 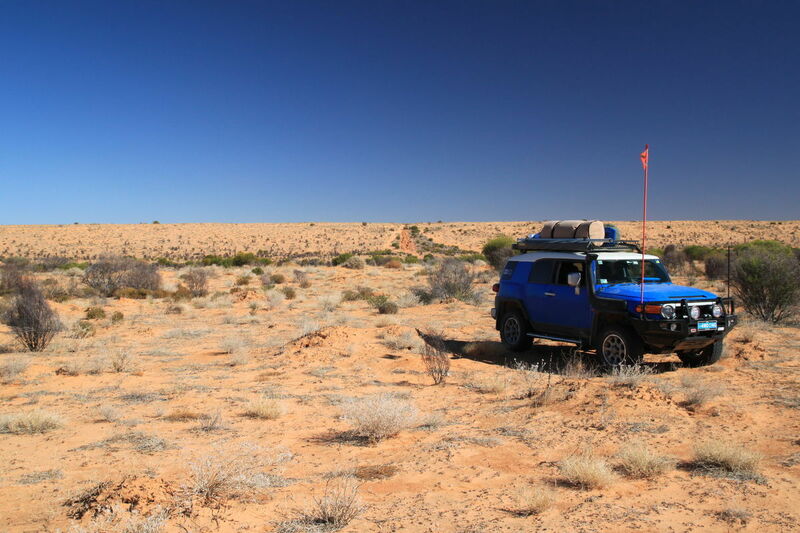 Anywhere between the dunes will provide a great hard flat surface for camping - and quite an abundance of old timber for fires if you didn't bring your own. 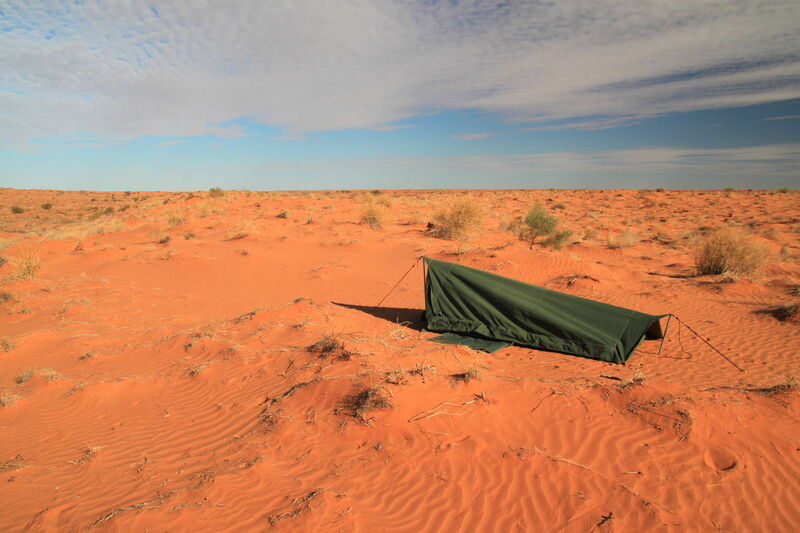 I set my swag up on top of the dune so I got some great views of the night sky, before we settled in for our first night in the true wilderness. 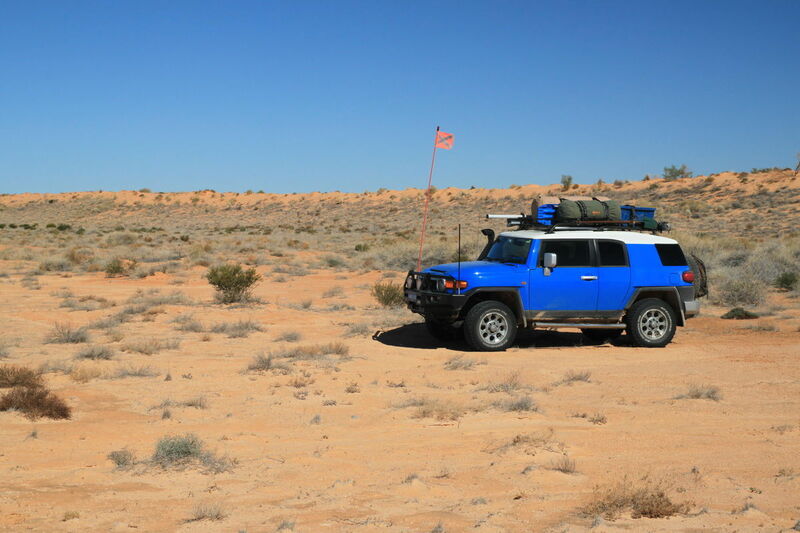 Our first full day of driving in the desert, and it didn't disappoint. 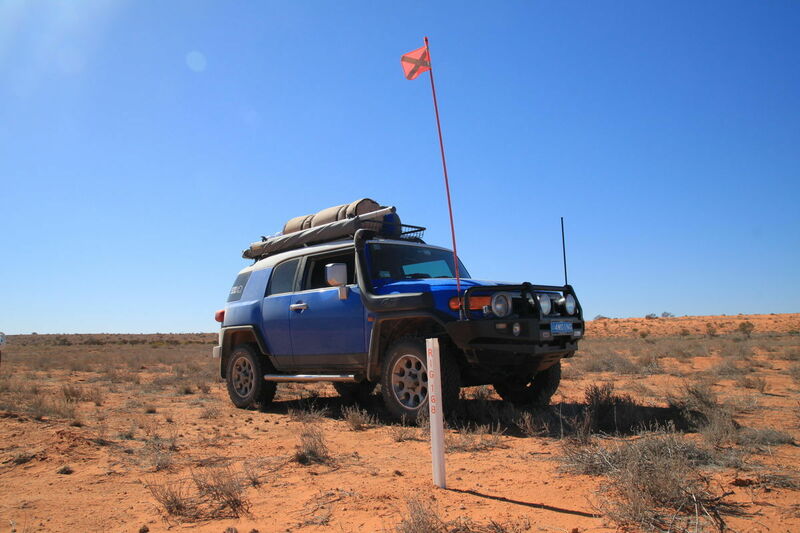 Shortly after breaking camp, we arrived at the junction between The French Line (road most common) and The Rig Road (road least common), we turned to the south and joined The Rig Road. 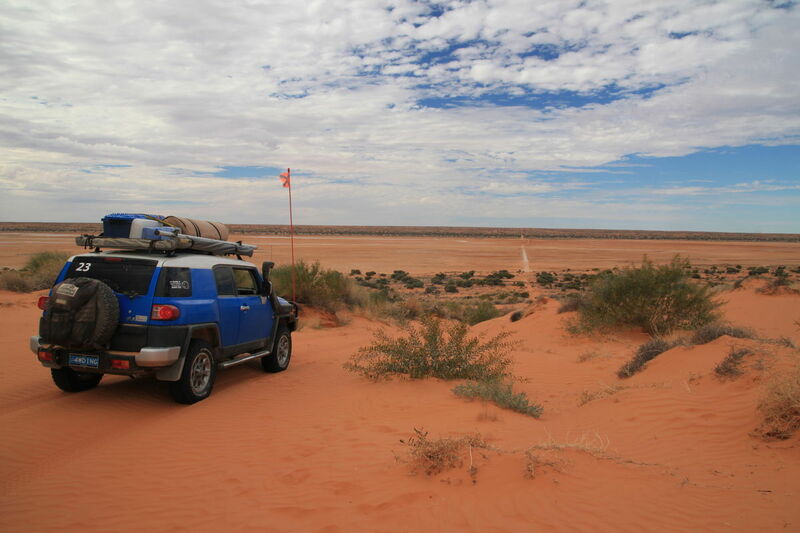 It was pleasant for a short while travelling between the dunes rather than over them, quite a different experience. We soon turned East again and back to the dunes. We had a short break at the old Glen Joyce Oil Well. 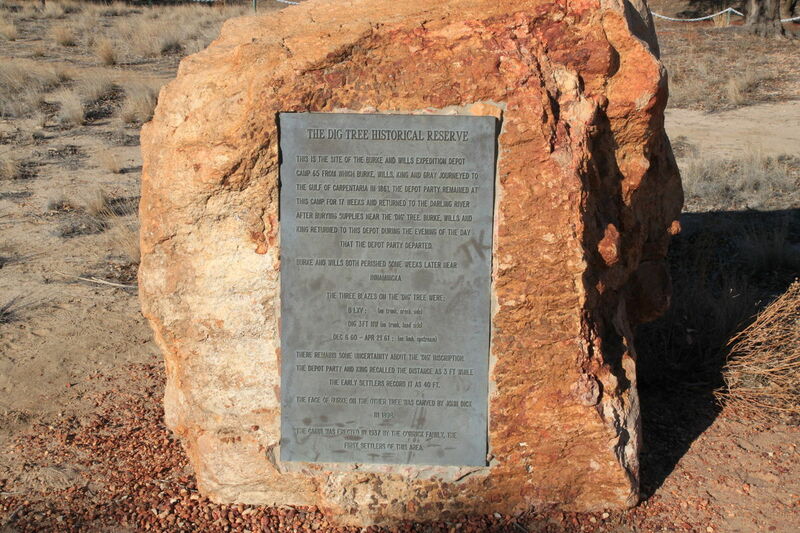 Its amazing that they used to drill for oil out here (hence the name, RIG road). After the oil ran out, they pack up and move on and leave nothing behind other than a flat piece of ground. There isn't a lot of shade or shelter out here in the desert so you have to be lucky to get a good lunch spot. Ours today wasn't too bad, just of the main track and gave Jack a nice dune to climb. After lunch the track again turned to the south and we headed parallel with the dunes for a while. We were now on The Rig Road proper, and the old road was still visible on the down side of the dunes. It used to be a heavy duty clay road which has slowly eroded over the years - unusable now, but still visible. 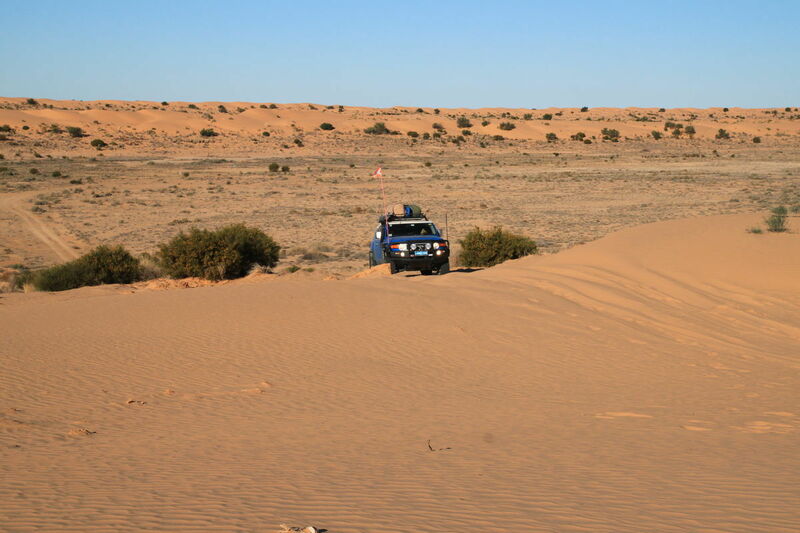 The track was ok to drive though, and we were not having any trouble with the dunes today. 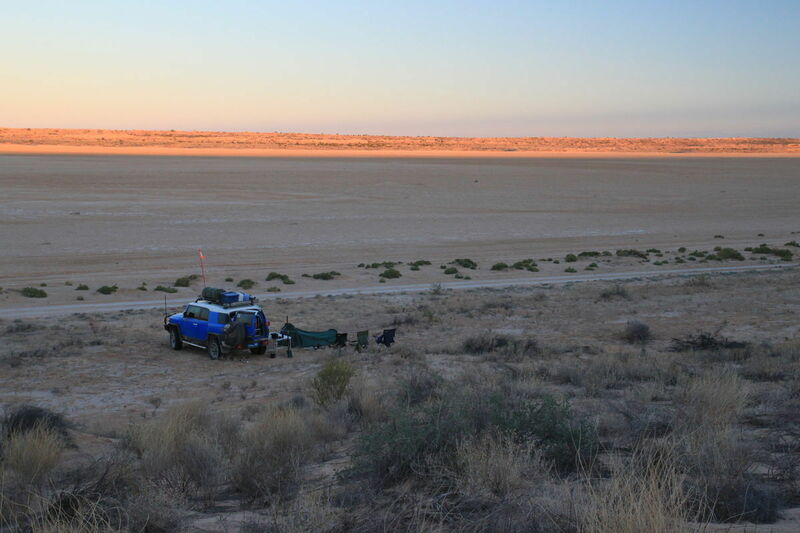 We eventually pulled up stumps and found a fantastic camp site perched on top of one of the large dunes. 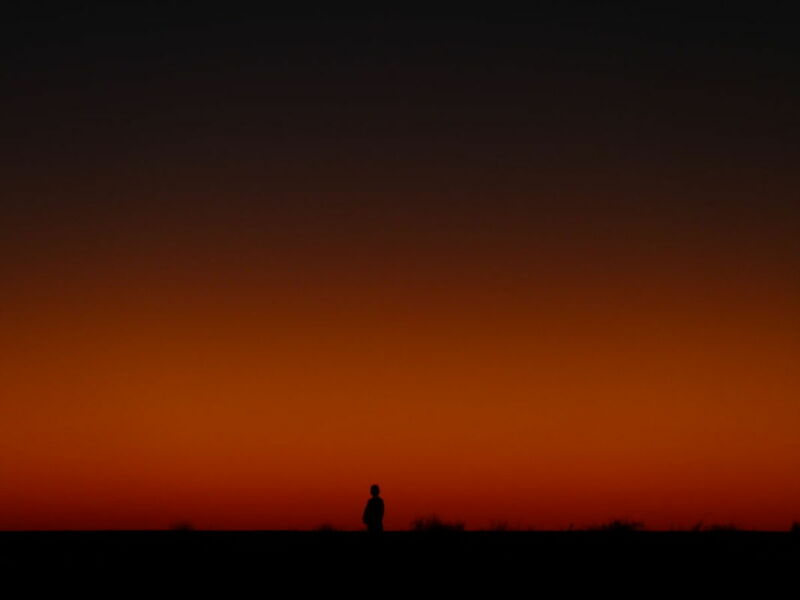 We had views to the West of the sunset, and I pitched my swag on the Eastern side of the dune for the sunrise! Where are the camels I hear you ask - still haven't seen any! However, after we had set up camp we found some camel tracks in the sand that we followed, and followed, and followed, but still now camels! 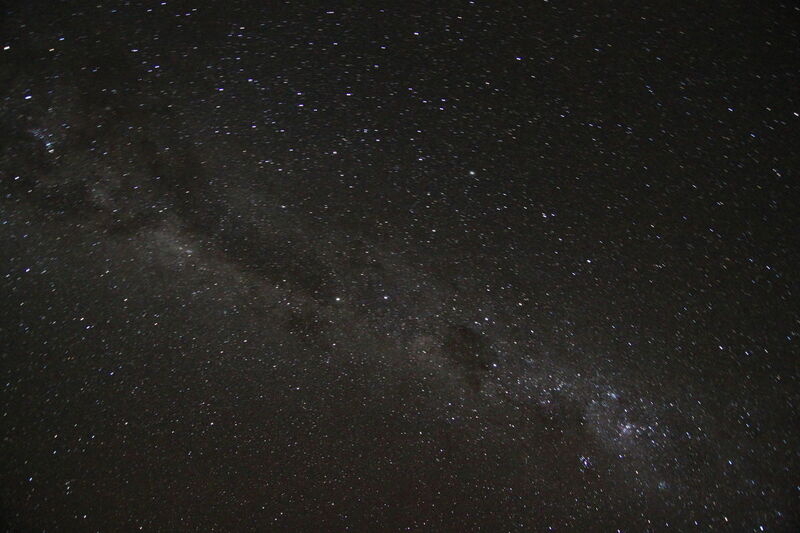 We settled in for a night of star gazing and animal listening - yes the dingoes were out! As I was to find out the next morning, they took a liking to me laying out on top of my swag, with little foot prints circling my sleeping area. Another day in the desert, more dunes to climb. 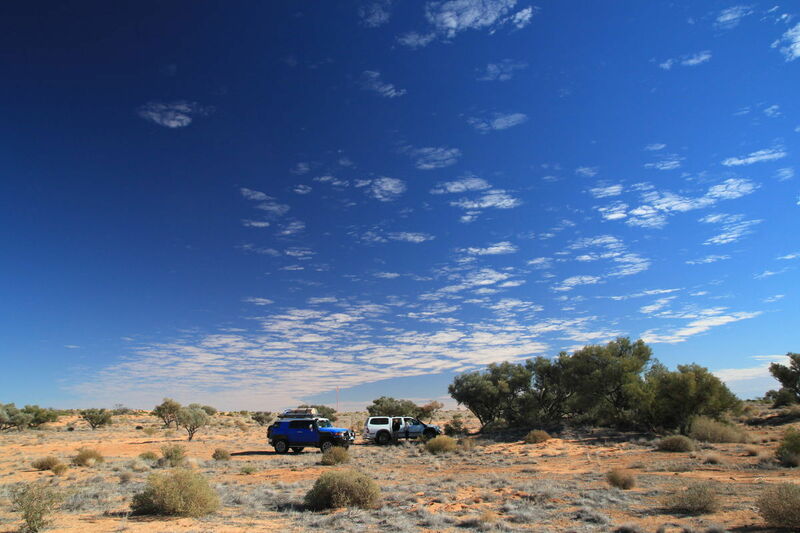 It wasn't long into the day before we again turned to the North and started driving between the dunes. 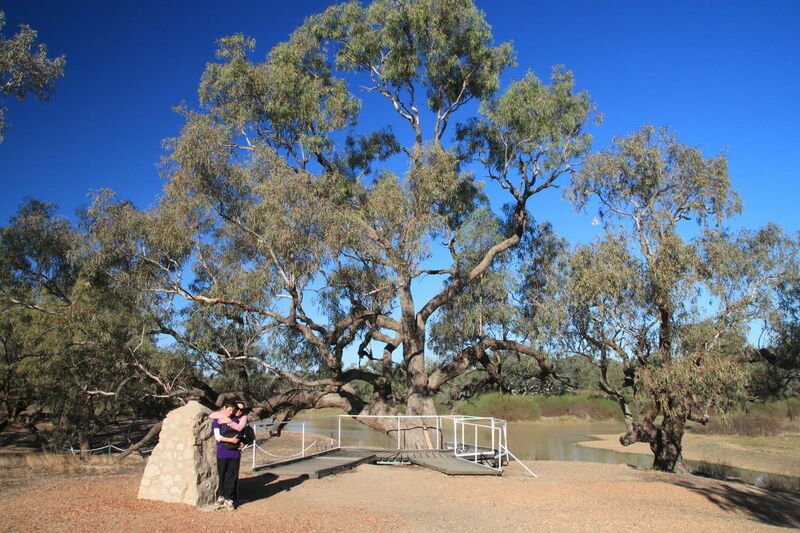 And then we arrived at The Lone Gum Tree. 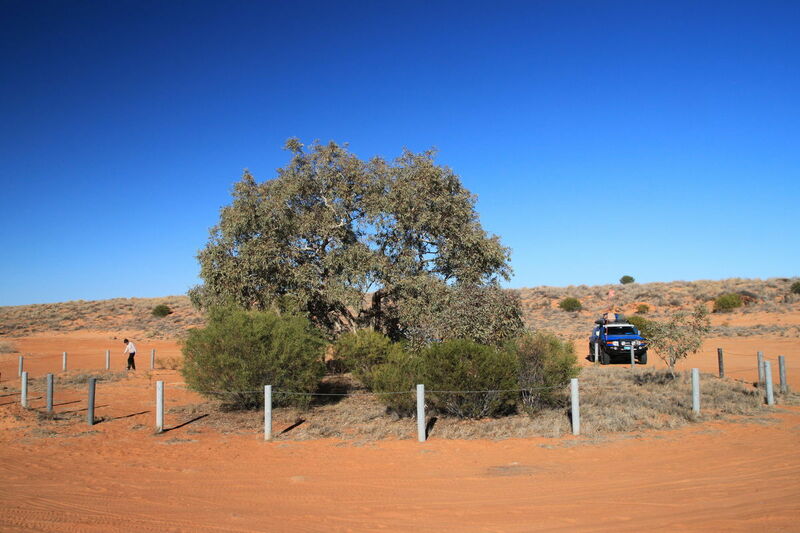 It was quite odd to find this gum tree just in the middle of the desert with just low scrub ll around, not only that but there was a Koala in it!!! 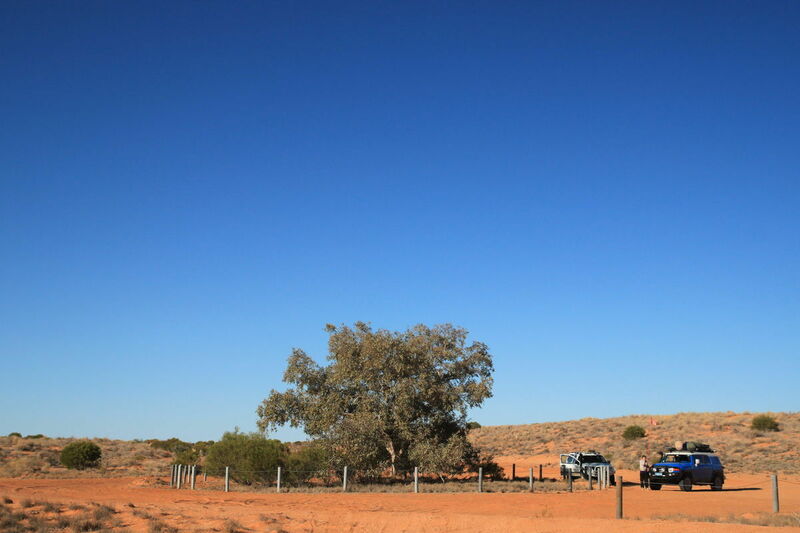 A short stop here, and we checked out the camping area for future trips - it was pretty good, nice and flat with plenty of space. 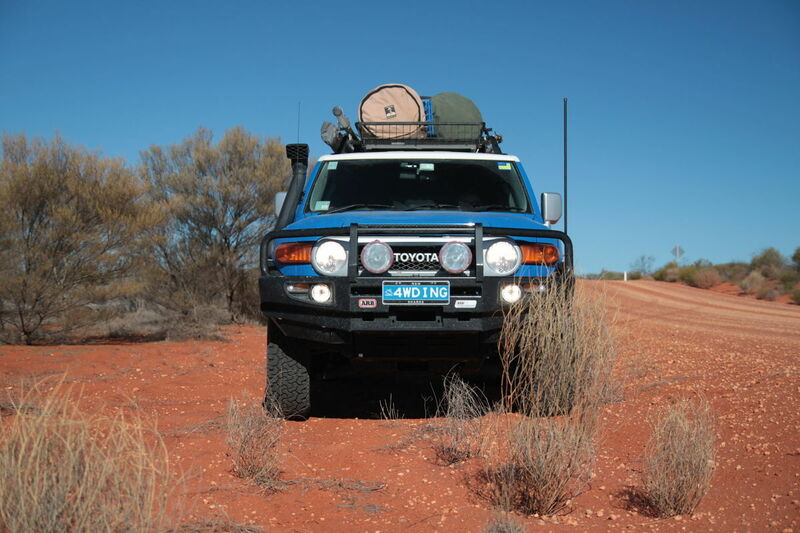 Then we were back on the track, continuing north until we reached the junction with Erabena track, where we gain bumped into the GDT guys heading towards The Lone Gum Tree, we turned East again. At this point we were getting close to the lake system of Poolowanna (obviously a dry lake system) which meant we were starting to see some of the dry mud flats between the dunes. 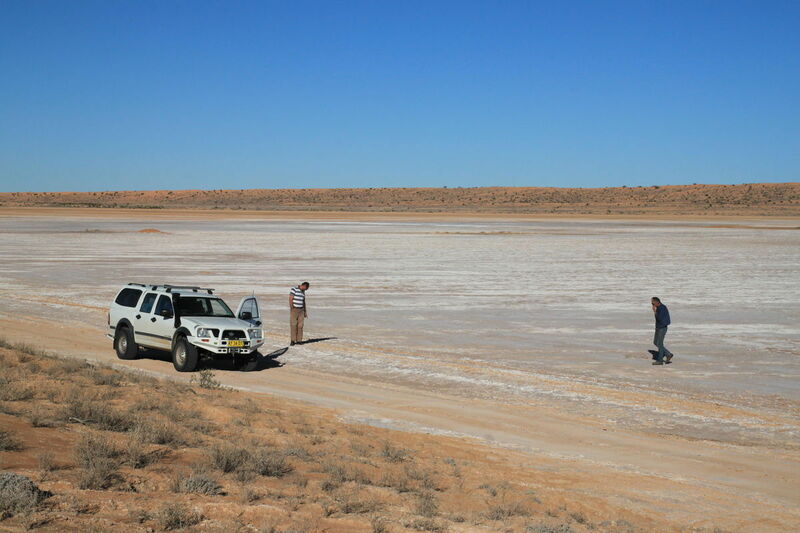 It was shortly after morning tea that we hit the first of the large mud flats - which are amazing to see, and this was really only the first tiny one of many to come! There were more twists and turns in the track, and the dunes started getting bigger. They were still pretty easy to get over at this stage, but definitely getting harder as there was not much traffic on this track. We had only passed two other vehicles all morning before stopping for lunch. In the afternoon, there was more north, east, north, east travelling. We eventually stopped for a break on a huge mud flat - these things are amazing, dont see them anywhere else in the country like this. 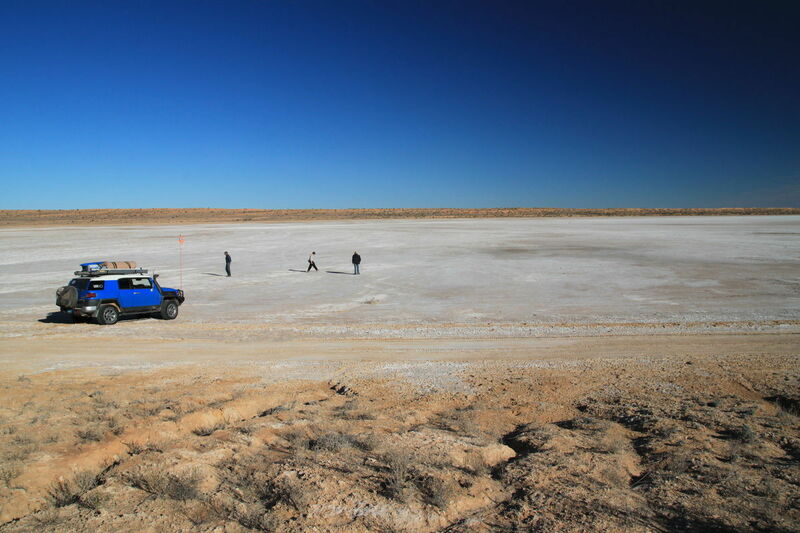 We got the opportunity to drive along the edge of a huge one for some time - you can make good time on these things! Just as we turned away from it, heading toward the K1 line, we came across another vehicle and a very sick looking trailer. They had snapped the draw bar on the trail on the rough road and couldnt get any further. 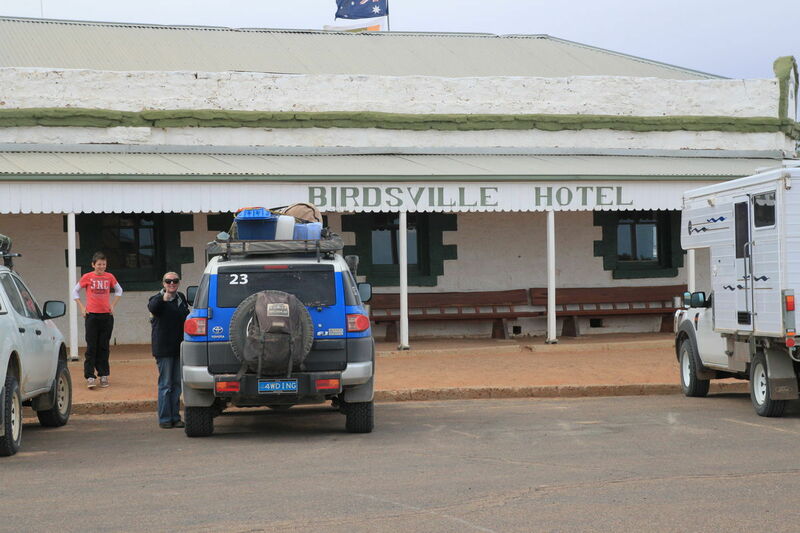 Fortunately they had been able to send their mate on to Birdsville for help. We checked they were ok and then pushed on to the K1 line junction. 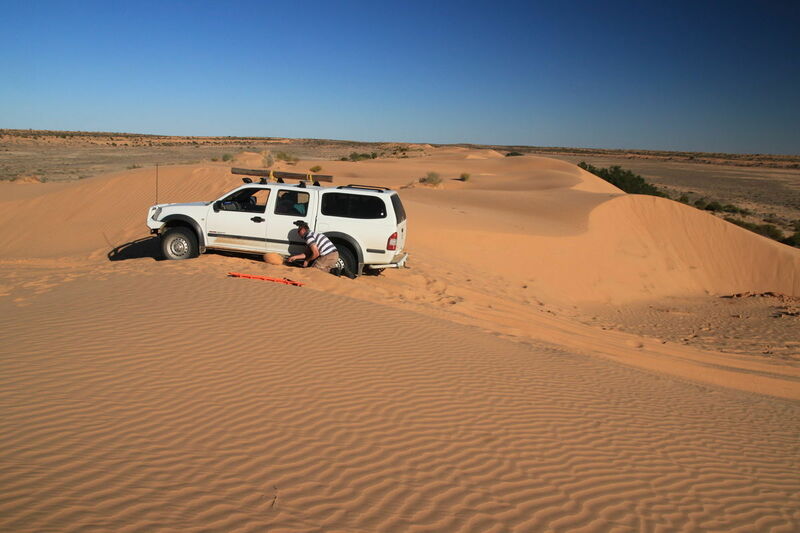 Shortly after turning onto the K1 line, we ran into a little trouble getting over a dune. 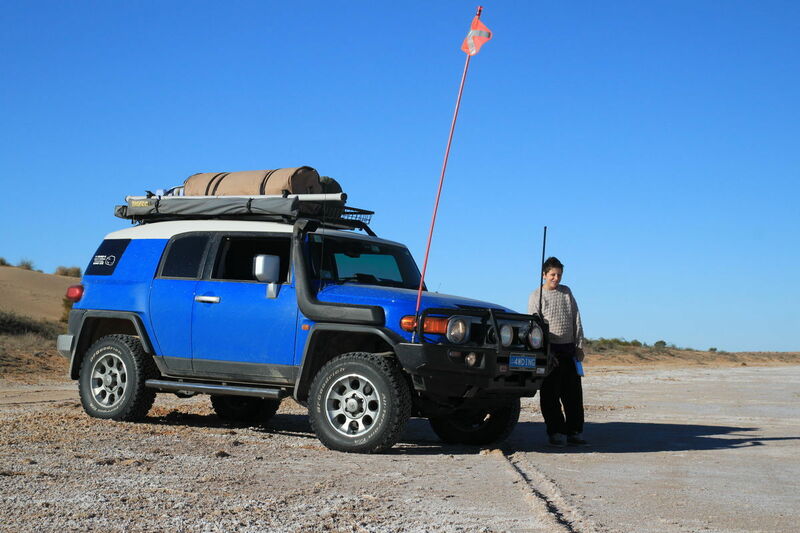 The FJ was ok, but the Rodeo's long wheel base didn't quite make it over a rather sharp dune. 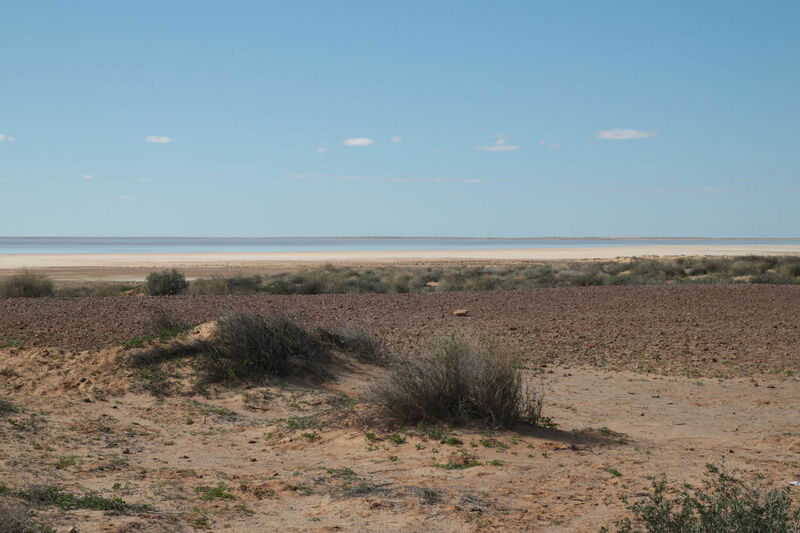 Didn't take us long to get things sorted out though before heading down the trail and setting up camp along side one of these amazing mud flats. 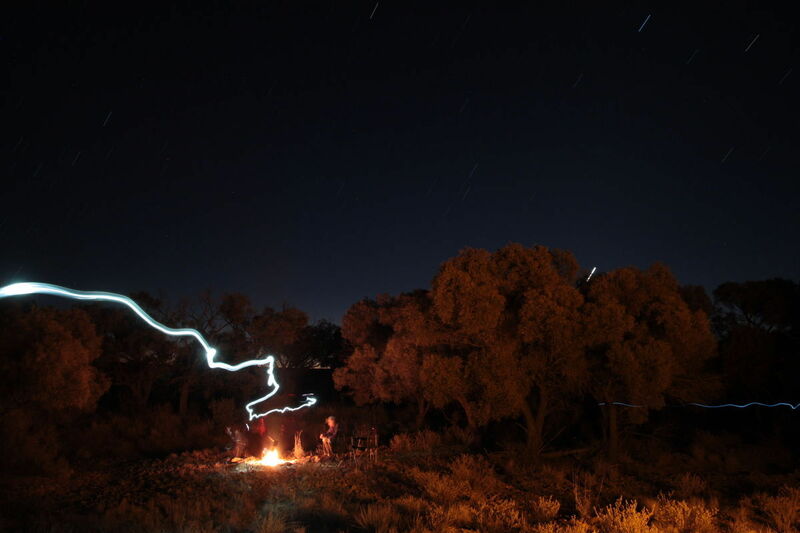 Yet another amazing night in the desert behind us, we left the "Mud Flats Campground" and continued north along the K1 line. 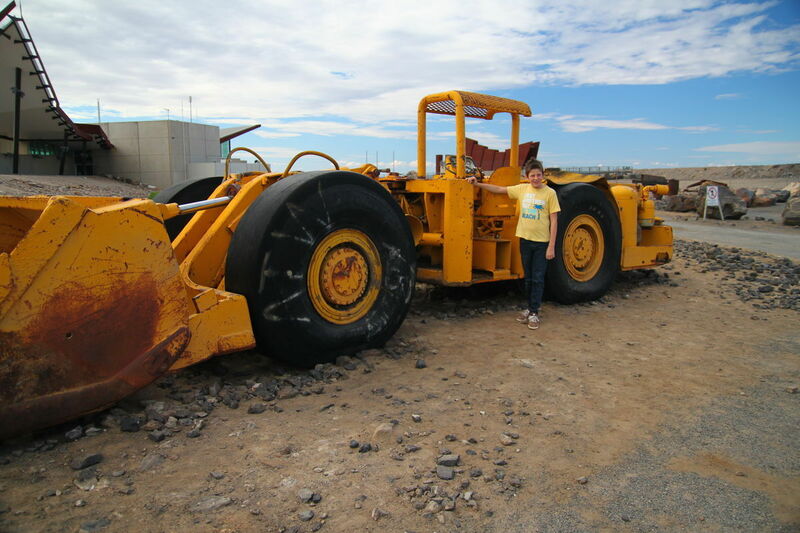 It took us a good 45 minutes before we cleared the mud flats that we camped at, these things are that big! Travelling North again, between the dunes we made pretty good time. Although there were still a few dune crossing which were becoming more difficult. The sand was becoming softer, and the dunes steeper so there were a few occasions where I had to have a second attempt to get over. 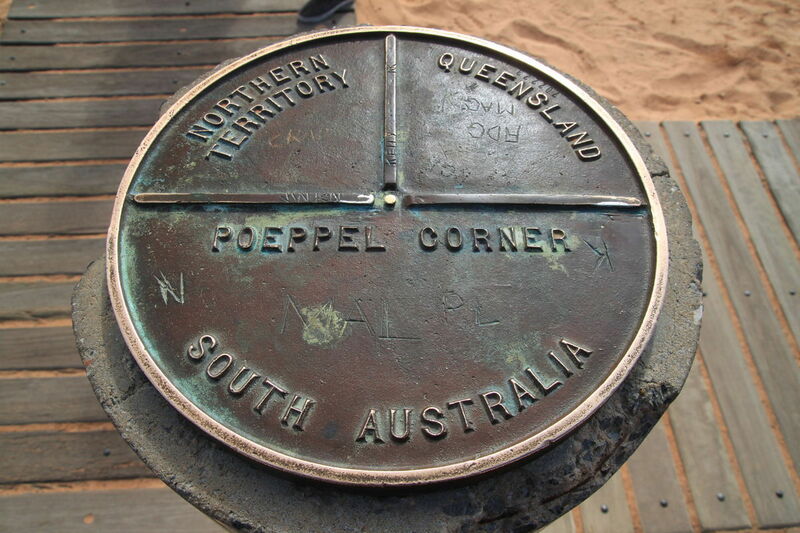 We eventually reached the junction of three states, Queensland, South Australia and Northern Territory at Poeppel Corner. 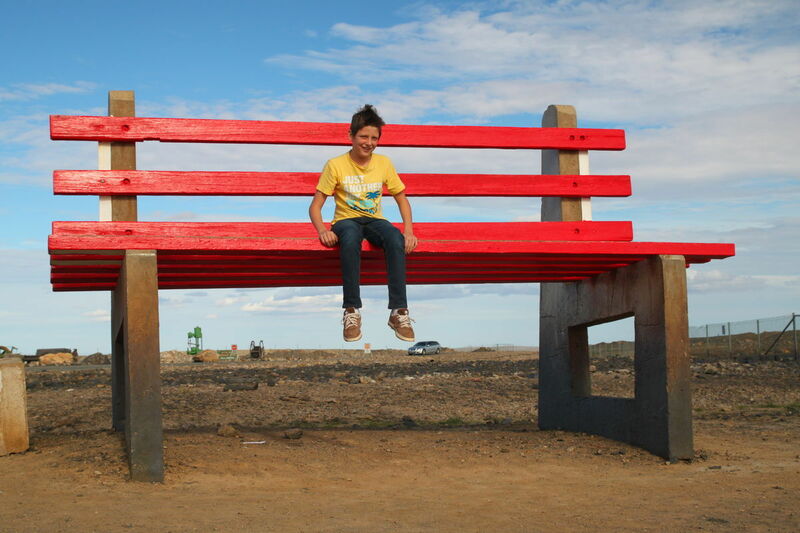 Definitely a great little detour to make so that you can sit in three states at once. 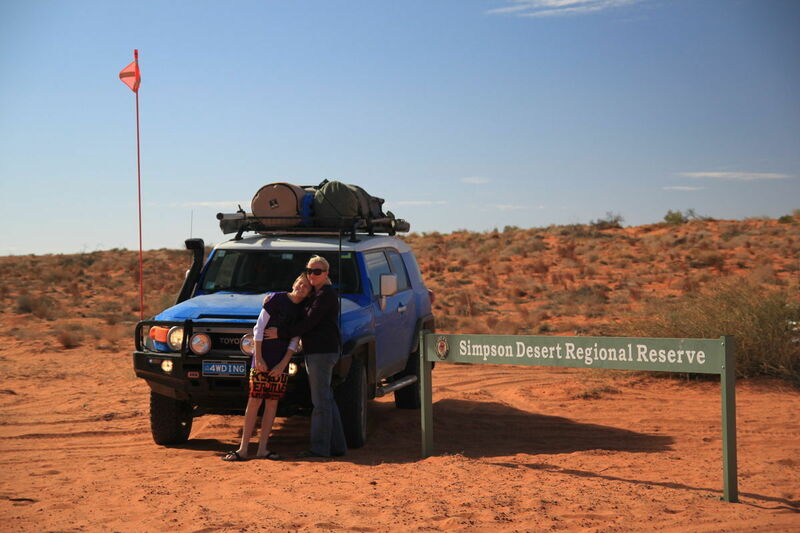 There were quite a few other vehicles here at the time, but still a good opportunity for a family shot of significance! 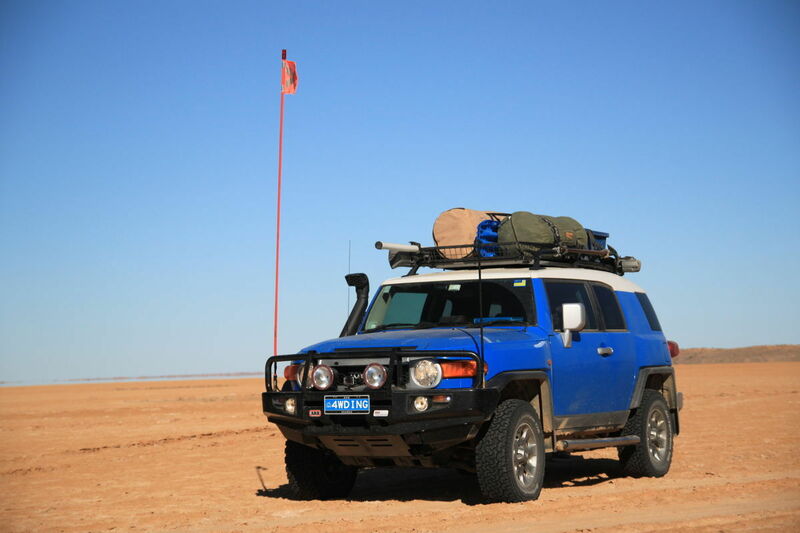 Once we had finished of Poepple Corner, we continued North until we hit the QAA line which heads directly East towards Birdsville. You get to do a great run across a huge mud flat at this point - I would hate to have been the first car across here at the beginning of the season! The amazing thing here was that we hit 80kms/h for the first time in a few days, and it scared my wife a little! 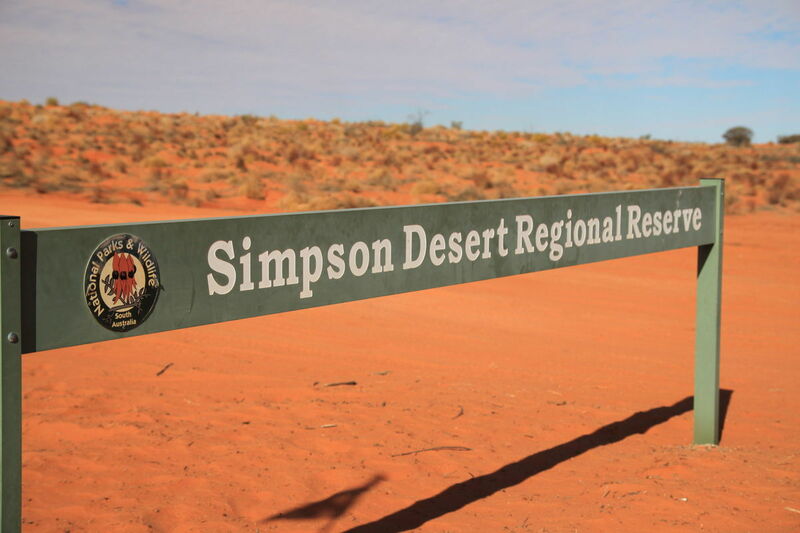 Shortly after the big mud flats, we passed some signs signifying the start of "The Simpson Desert National Park" - so what have we been driving through the last few days?? 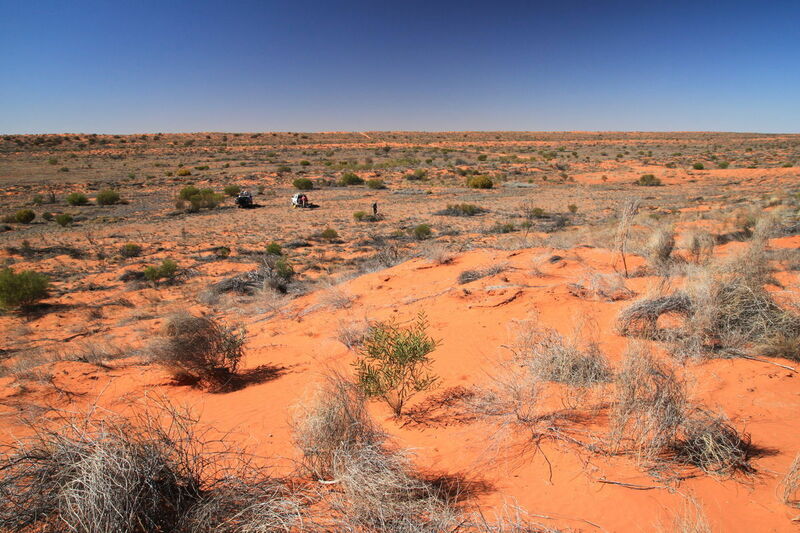 As we continued to travel East, the distance between the dunes was getting greater, as was the height of the dunes. 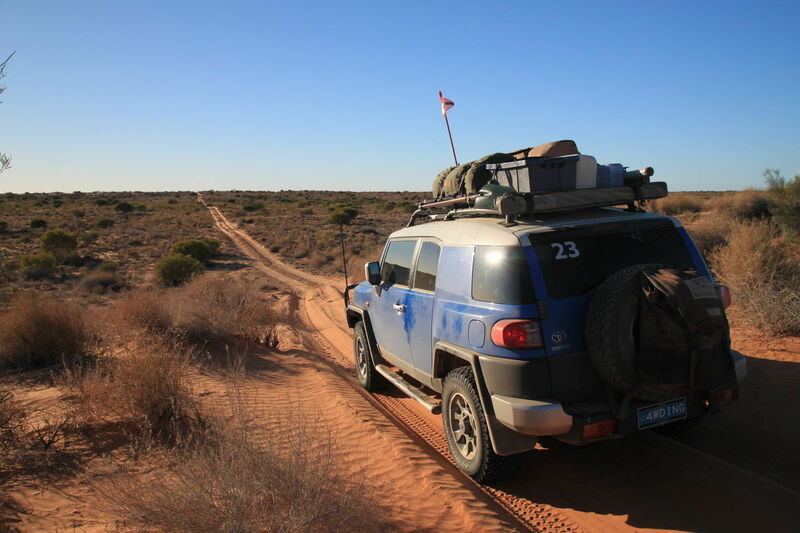 The tracks between the dunes were rough and corrugated badly, shaking everything in the vehicle - but nothing fell off this time!! 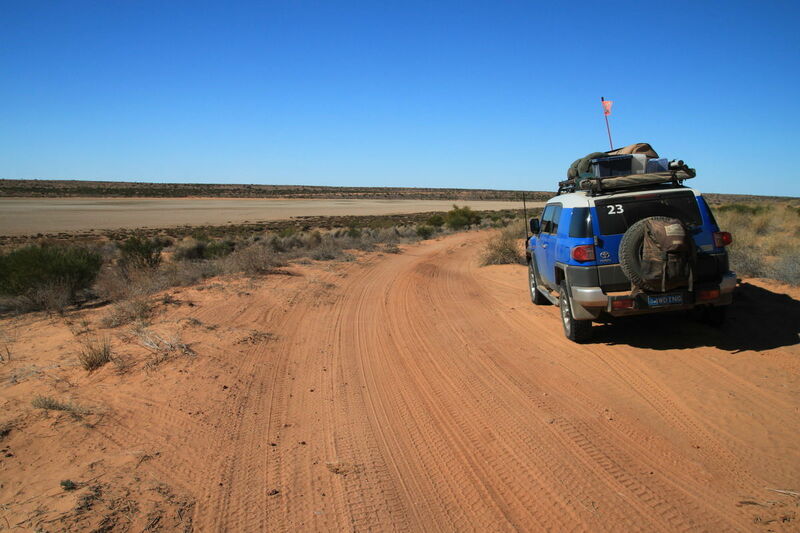 We also had to pull over a number of times to let oncoming vehicles past, not something we had to do often following The Rig Road for so long. 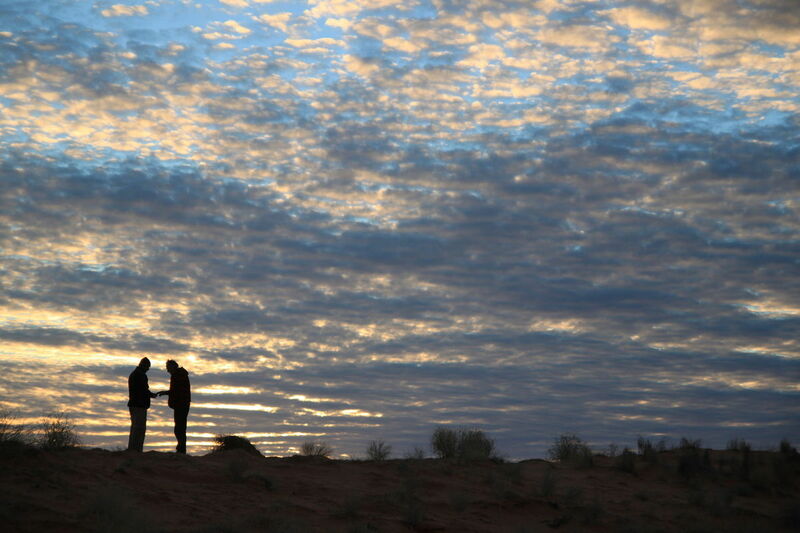 Unfortunately, our last full day in the desert eventually came to an end. 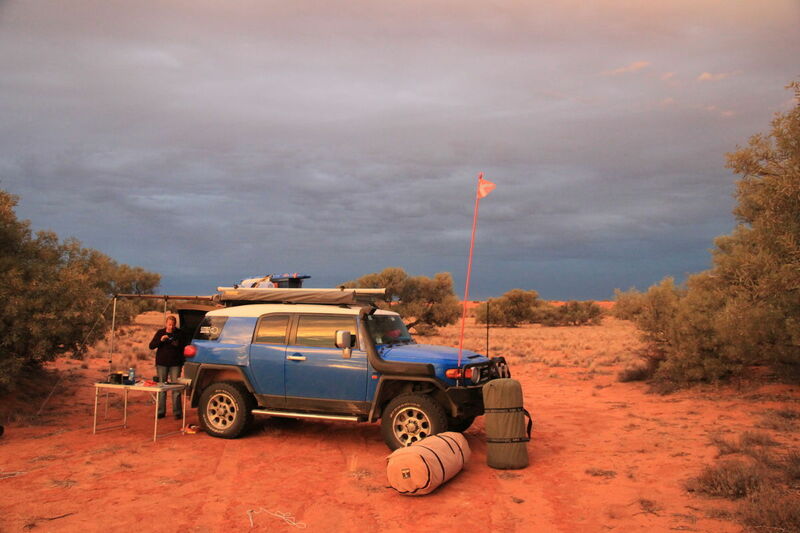 The weather looked like it was ready to turn so we found a good spot with some shelter for the night. 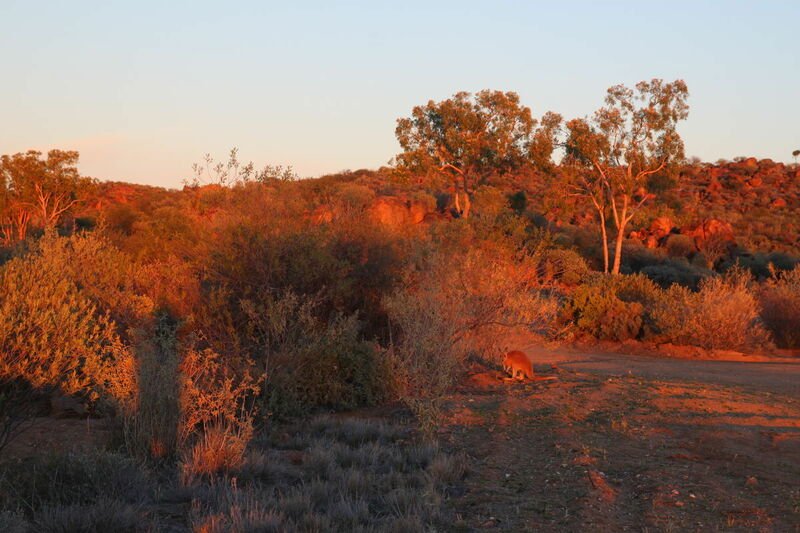 Another dingo was wandering around our camp later in the evening, they all look very thin so there has not been a lot of food around for them recently. 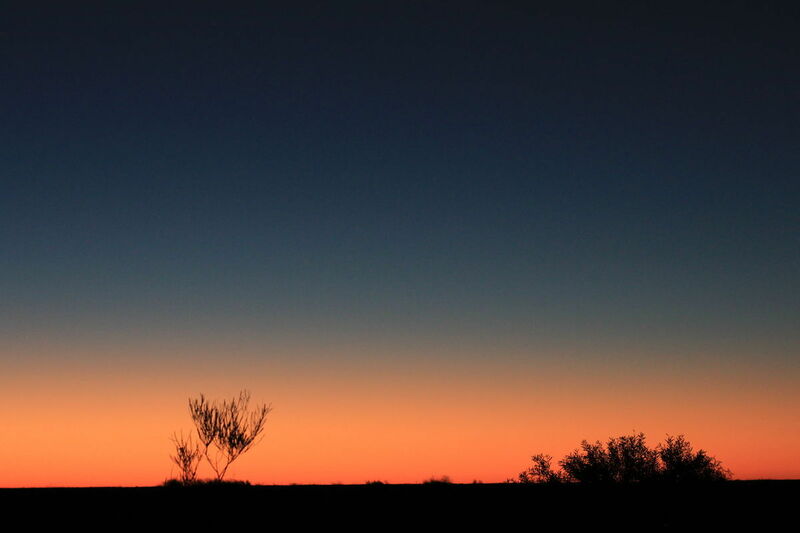 During the evening, there were plenty of vehicles passing our camp, both heading toward and away from Birdsville. We sat back and relaxed and started our preparation for attacking Big Red tomorrow. We were up early today, and heading towards Big Red which had been the location for a big concert last night supporting "The Big Red Run" which is a charity event raising money for Diabetes research. 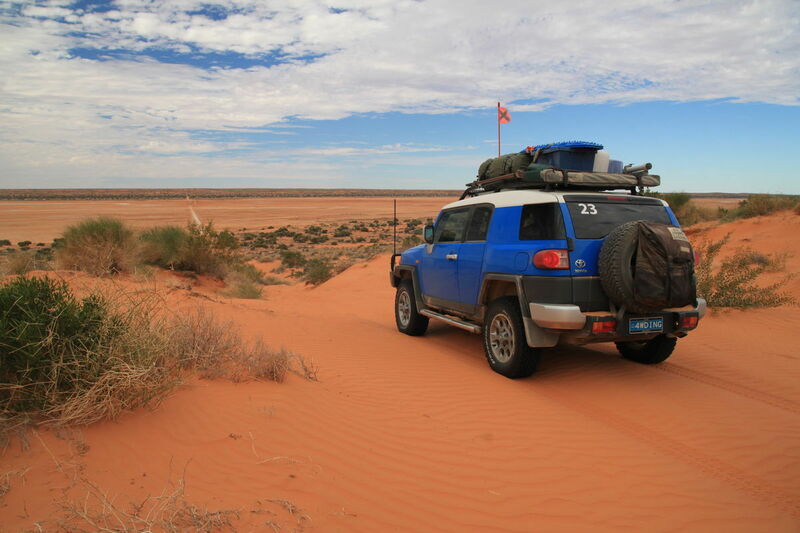 We hadn't camped too far from the last sand dune in the desert, so the journey didn't take too long. However, there were a few spots of rain starting to fall now so hopefully we were not going to get with a downpour too soon! 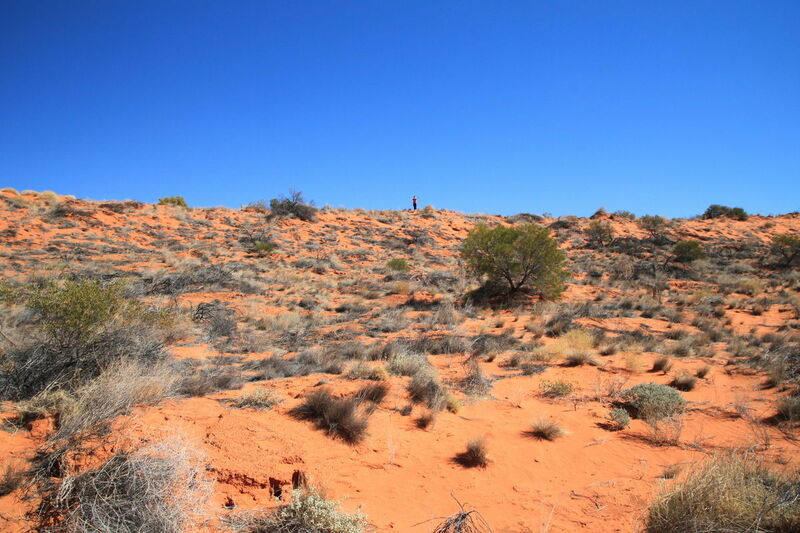 There were a number of large dry creek beds that we had to cross before we finally reached Big Red, which could fill with water very quickly if it did start raining. 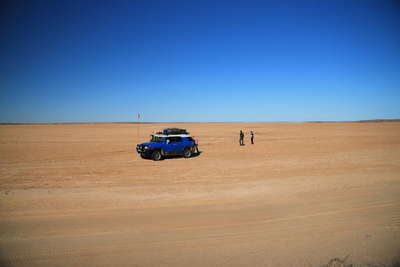 We were fortunate though, and reached the giant dune shortly after 11 am. There was quite a bit of activity at the bottom of the dune as this was obviously one of the staging areas for The Big Red Run. There were a number of tents set up along with associated support people. 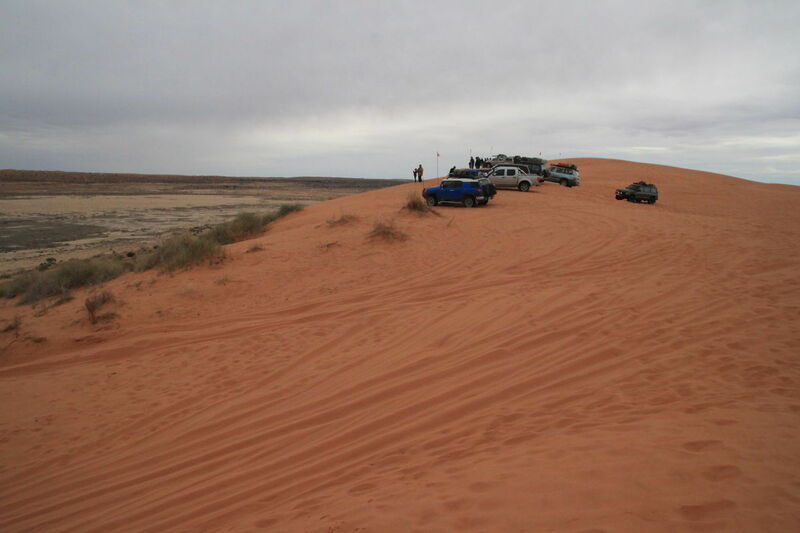 There was also a number of vehicles lined up waiting to take a run at the dune. Eventually it came to our turn. 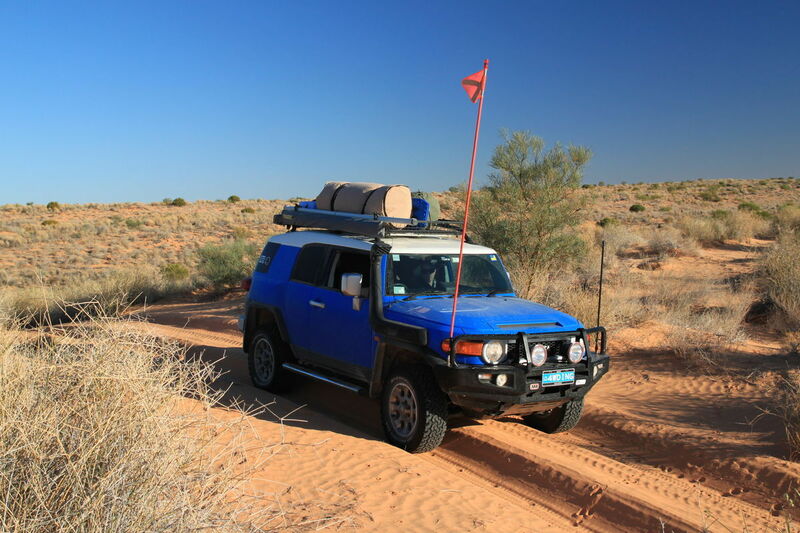 I had let the tyres down a little more to bite into the soft sand, and selected the track to the right (there were two main tracks). 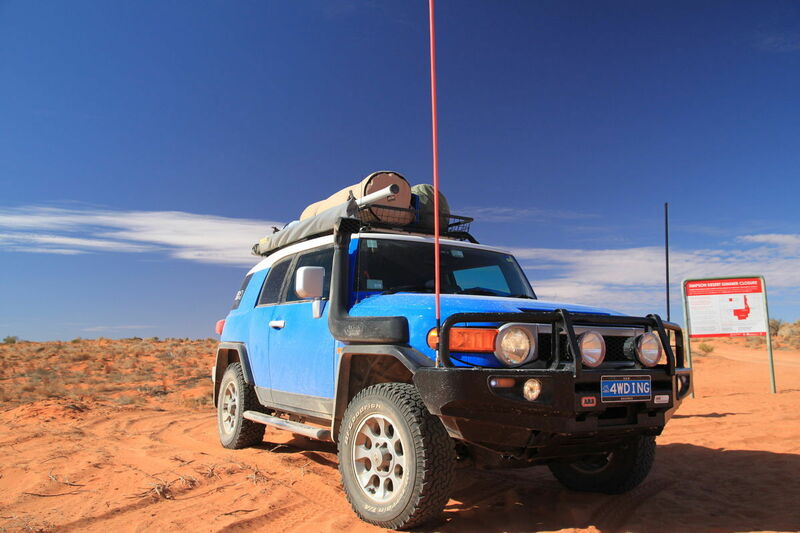 Hit the pedal, and surged up the dune without issue! Sitting at the top looking back on everything bellow was pretty amazing. Red was next, and after an initial false start, he was up there too. Of course with two tracks available, I had to take another run! And so down we went, and back up the left track which people were calling 'the difficult' track. 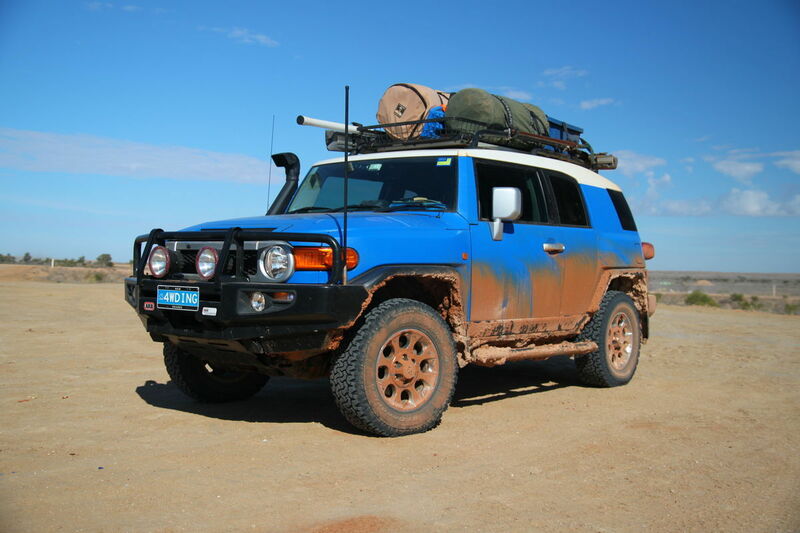 Again, the FJ did it easy. 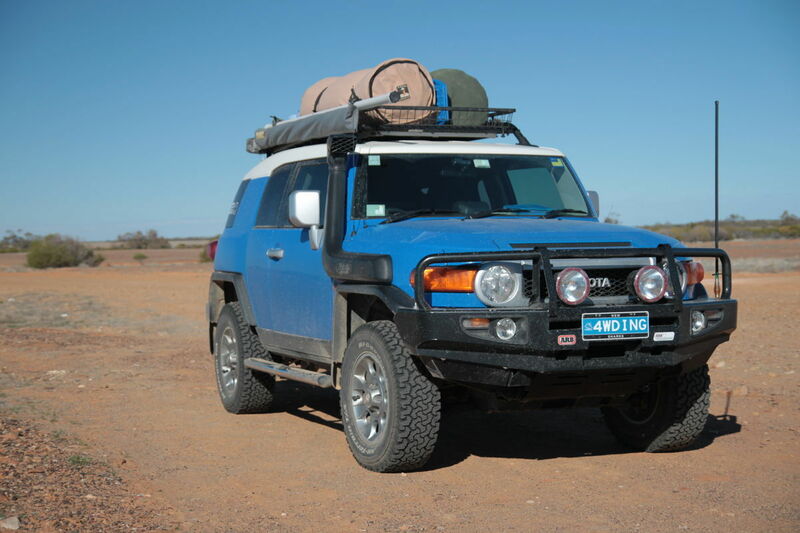 So with that obstacle out of the way, we ran down the other side to put air back in the tyres and take the 'road' out to Birdsville. 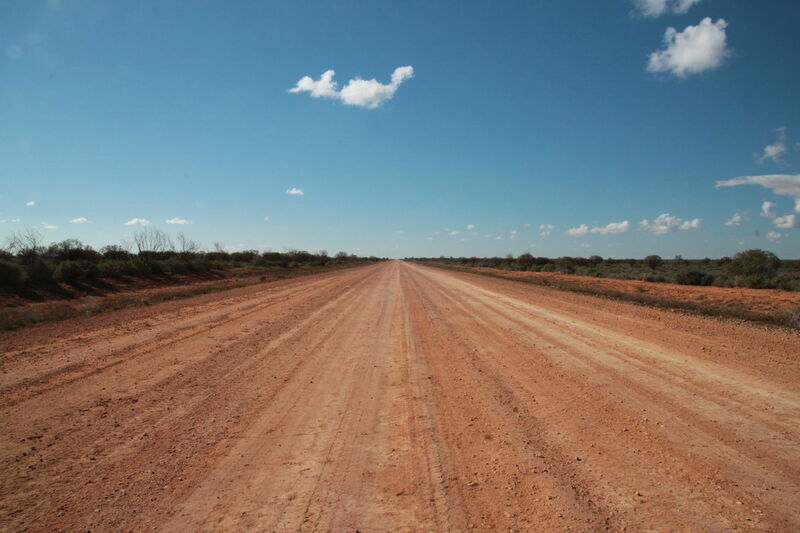 The drive back to town is along a well maintained gravel road, and takes about 25 minutes. 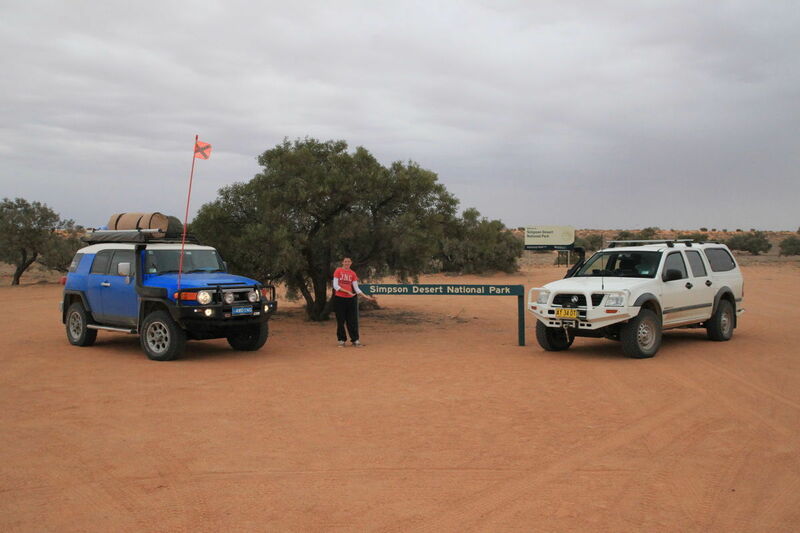 We arrived at Birdsville and once again bumped into our mates from GDT. Apparently they had had a late night getting some sick vehicles back into town. They all made it safely though, so better late than never! 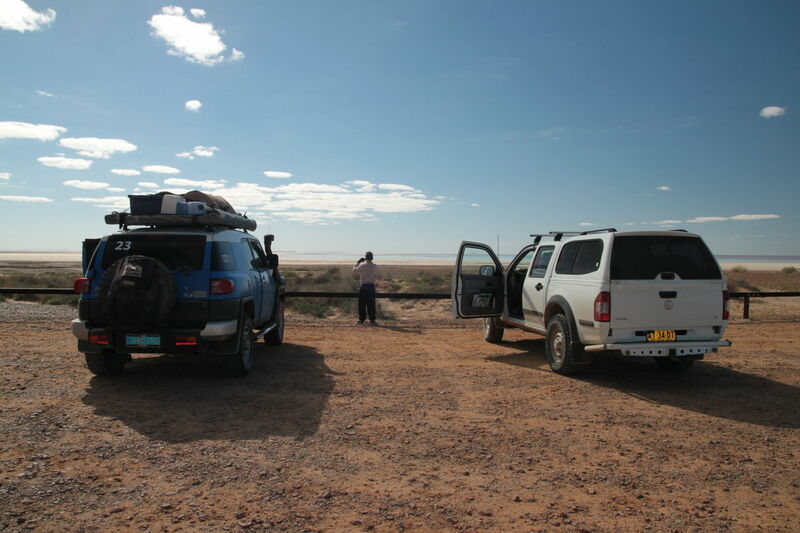 We filled up our fuel tanks, and our stomachs (finally some camel!) before continuing on to the East and out of town. 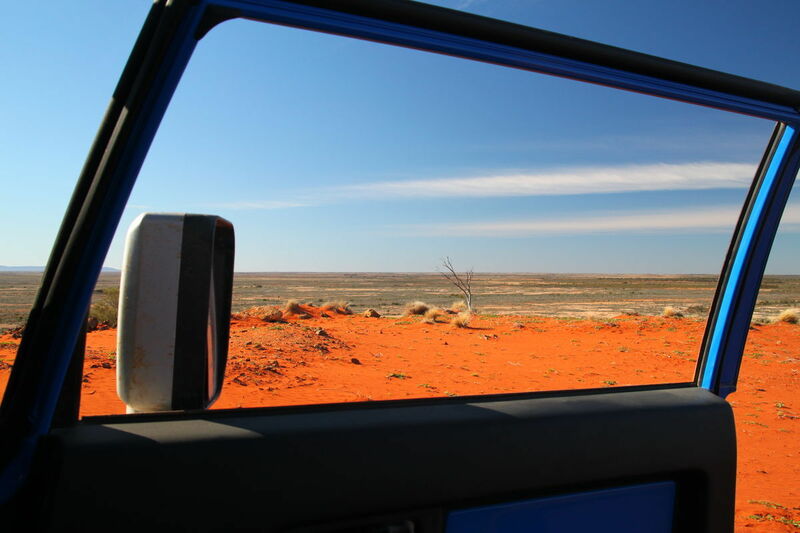 Heading out of Birdsville was pretty easy, but even I managed to miss the turn off and headed south along The Birdsville Track before Red gave me some directions! Back on the appropriate road, we made some good time - the road was hard and covered in black stuff! We even drove down a real runway which forms part of the main highway! 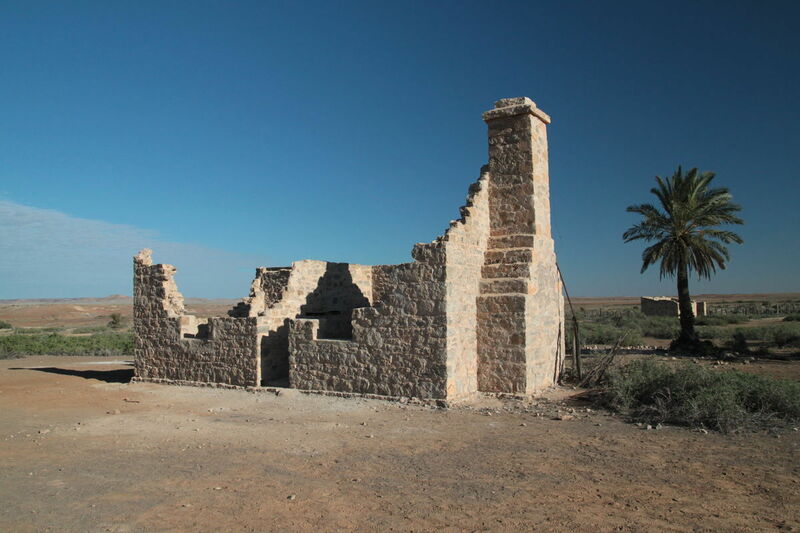 Eventually we find our next turn off which takes us to the South and on to Cadelga Outstation Ruins. This is where the rain started up again, and was looking like it was going to dampen things down a little. But before long we bumped into our friends from GDT again which brought life back to the party! They were looking at camping down river from the ruins, we decided to push on a little further to see if we could find something better. We eventually stopped alongside another river which wasn't a bad spot, although possibly a little close to the main road! And then the rain...Overnight the rain didn't come down heavy, but came down constantly. Tomorrow was going to be very interesting. We woke to a rather damp camp. It was still spitting with rain, and there was a lot of water on the ground. We packed up slowly, contemplating what lay ahead. 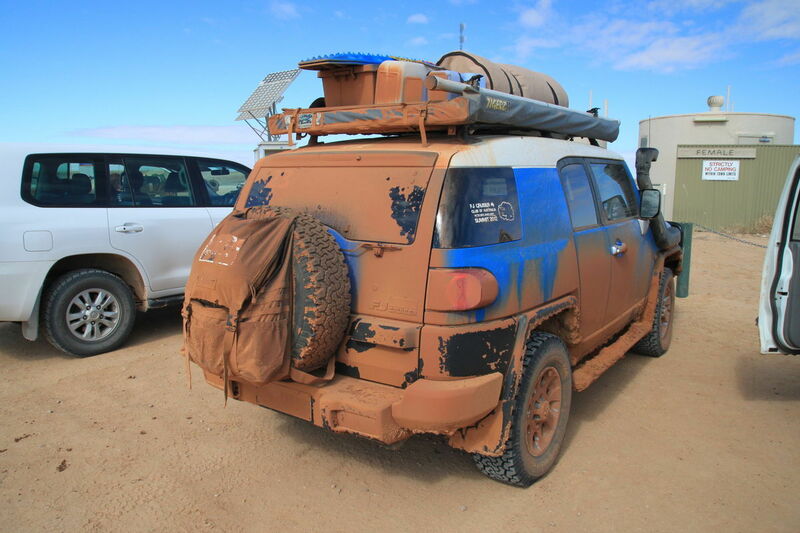 And eventually we hit the road - the mud. The track was pretty awful in places, with mud inches deep we had no option but to push on. Traction control tried to keep me stationary too many times so that got turned off - which gave me the ability to power slide around corners at 10kms/h!! Even so, it was probably the most stressful part of the trip for me so far, oddly enough, Red was loving it! 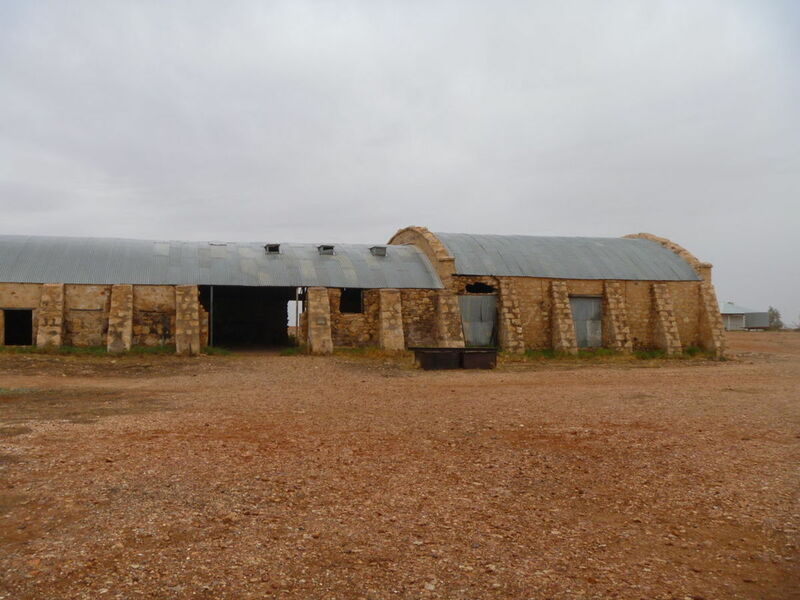 We made a stop at the old Cordillo Downs Woolshed which used to be the larges in the southern hemisphere. Its nothing more than a shell now, but still a pretty interesting spot to take a break. 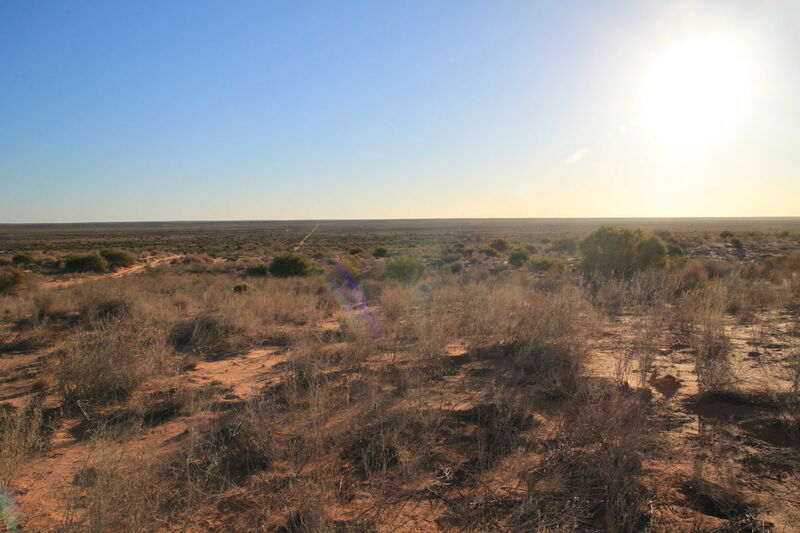 After that we pushed on towards Innamincka. As we got close to town, we were surprised to see road clean-up crews hard at work picking up rubbish from the side of the track! Not just one group, but possibly six or eight vehicles all doing it! (We kept seeing these guys for the next couple of days). 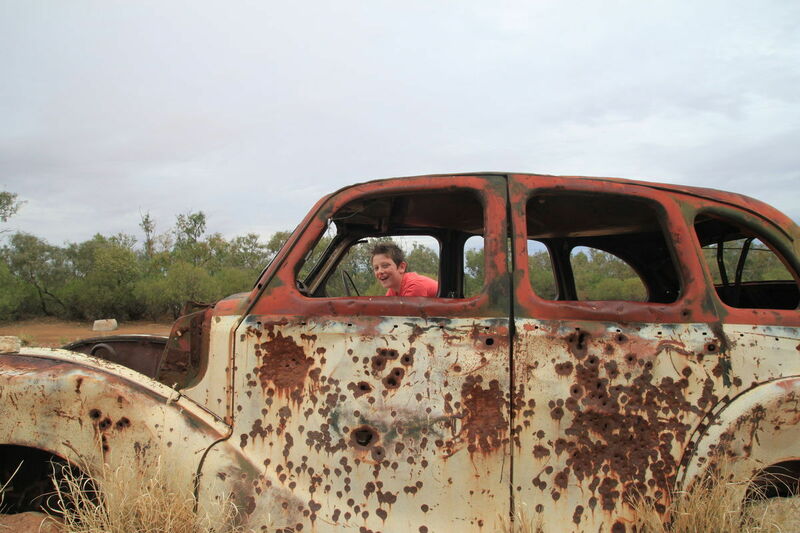 We rolled into Innamincka right at lunch time, with trucks covered in red mud! 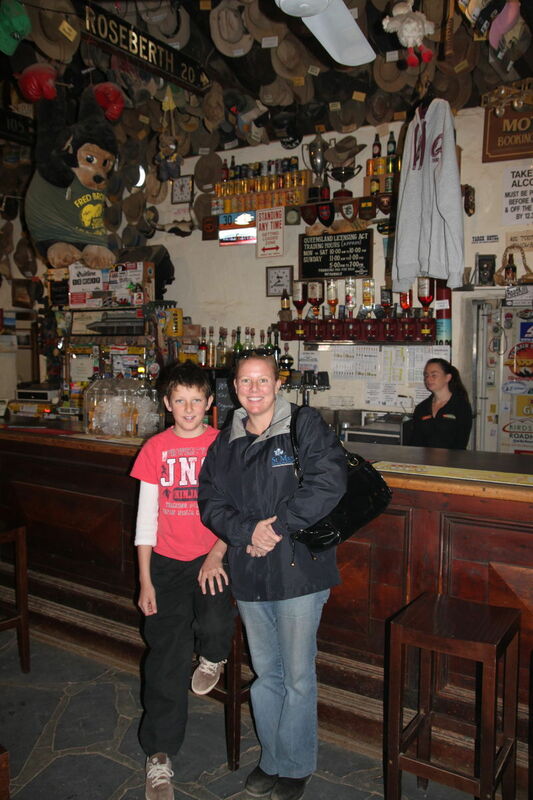 Fortunately for us, we could quickly hide away in the only pub in town and order up a fantastic counter lunch! 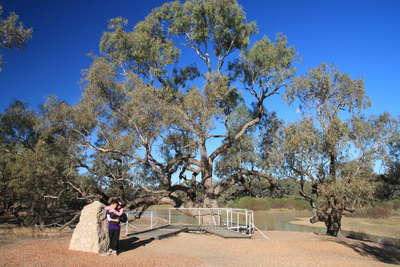 After lunch we head out of town to the East looking for the Burke & Wills Dig Tree. 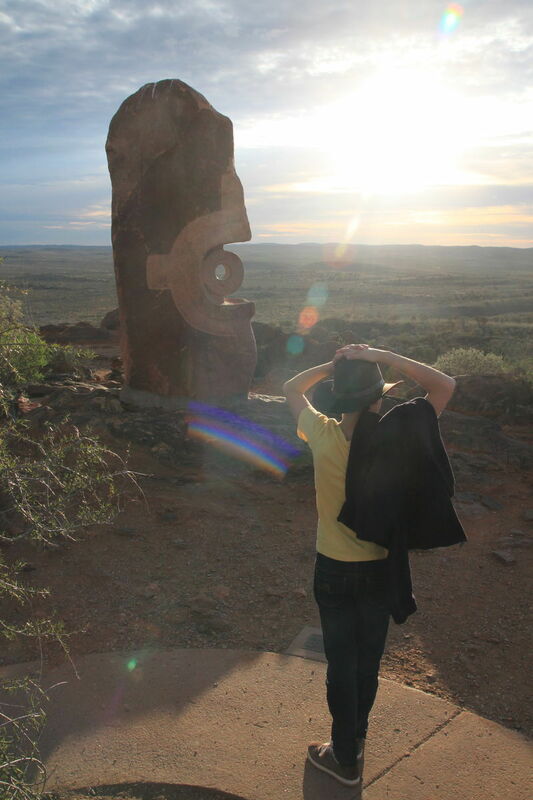 Its quite a drive out of town to get there but well worth the drive to see this amazing piece of Australian history. 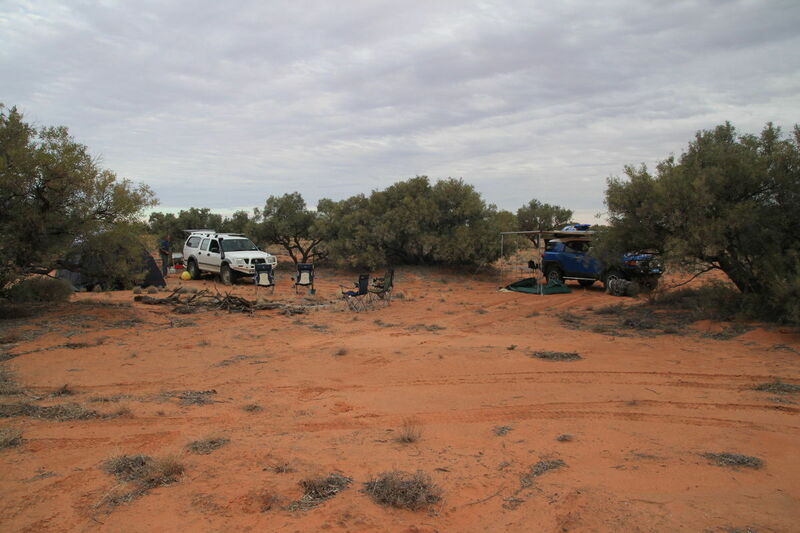 We then had to head back to town to our camp for the night alongside one of the highlights of the trip, Cullyamurra Water Hole. 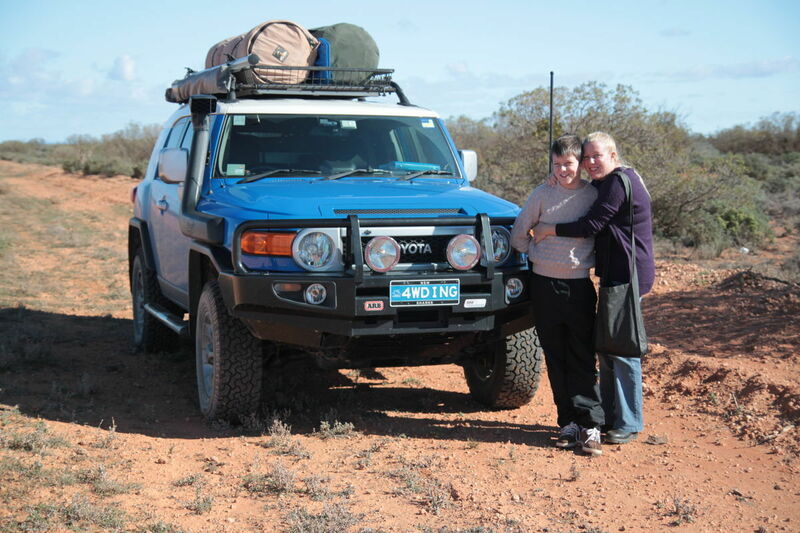 Before we got there though, I stopped along the highway to help a couple replace a tyre on their motor home. Bloody hard work that was out in the afternoon sun. Amazingly the couple turned out to be locals of Wollongong too! 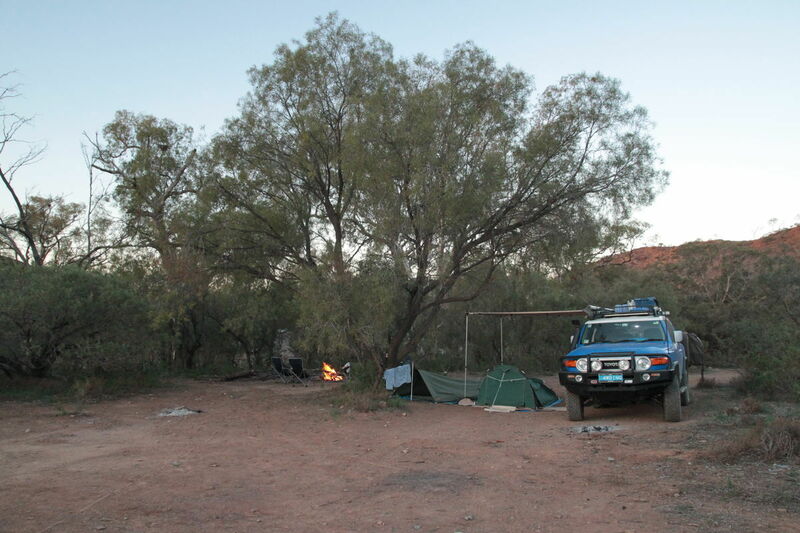 While we were playing mechanic, we let Red head down to Cullyamurra and pick out a camp site for us. I remember last time I was here you could easily get down and swim in the river - which I was looking forward to! Unfortunately there has been a lot of flora growth along the banks now which made swimming impossible. Despite that, we had an amazing camp site looking over the river as the sun set. And with our neighbours serenading us all night with pretty good renditions of well known country songs. 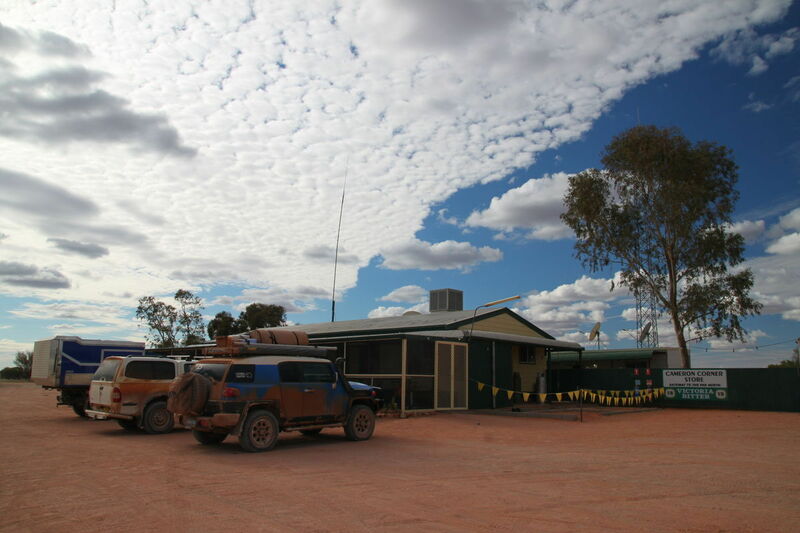 Unfortunately we only had one night at Cullyamurra, so it was time to pack up and hit the road. 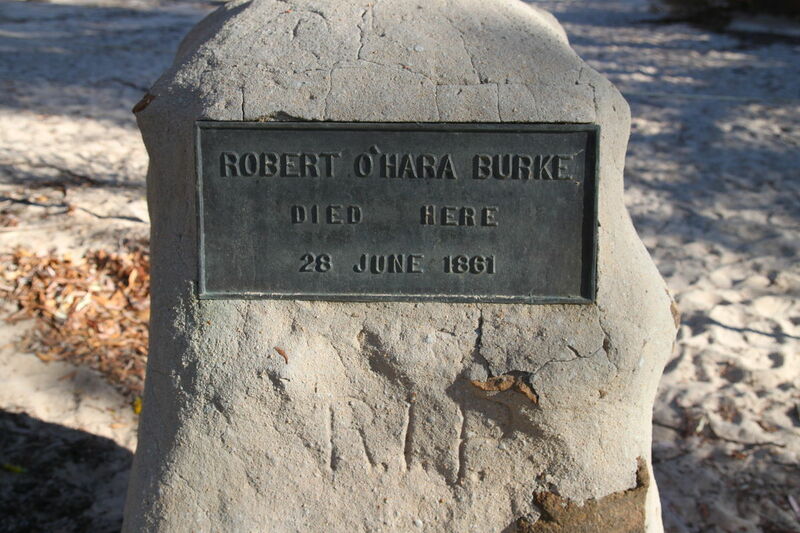 We made a short detour on the way back to town to check out the grave of Robert O'hara Burke. 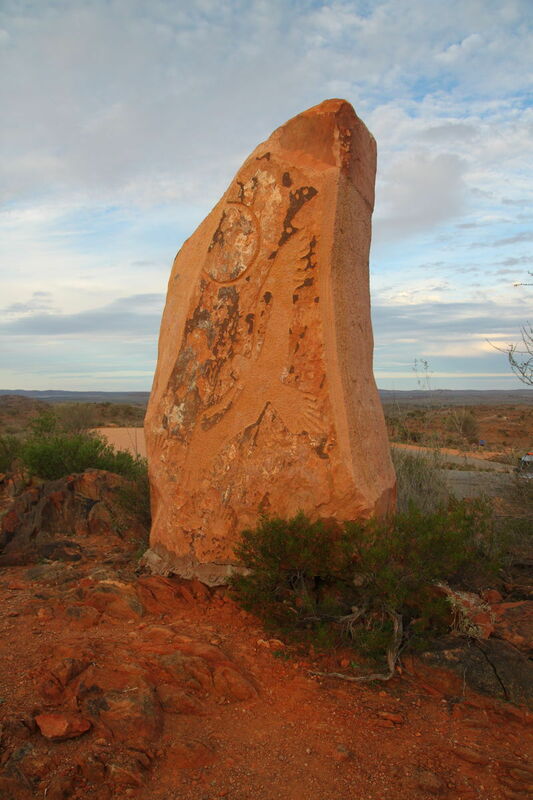 His grave site and story is located just a few kms from our camp site and is a very peaceful place. 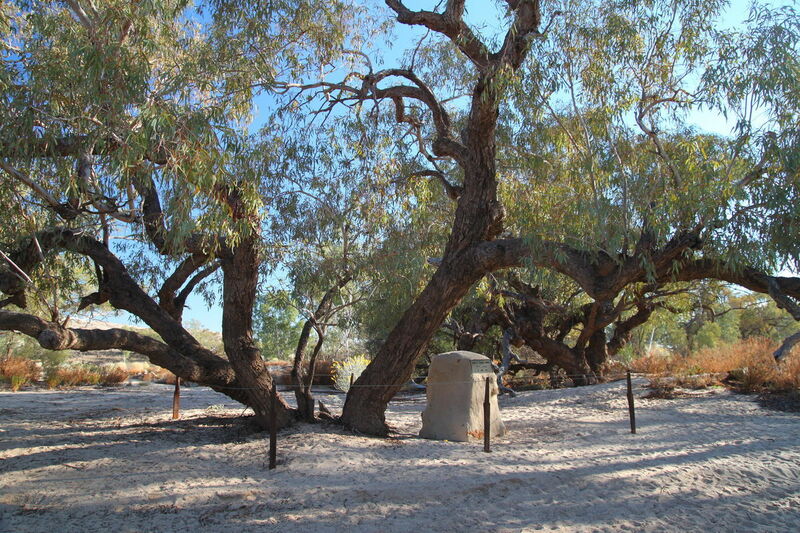 The tree under which he finally passed away is still standing, with an appropriate memorial in place. 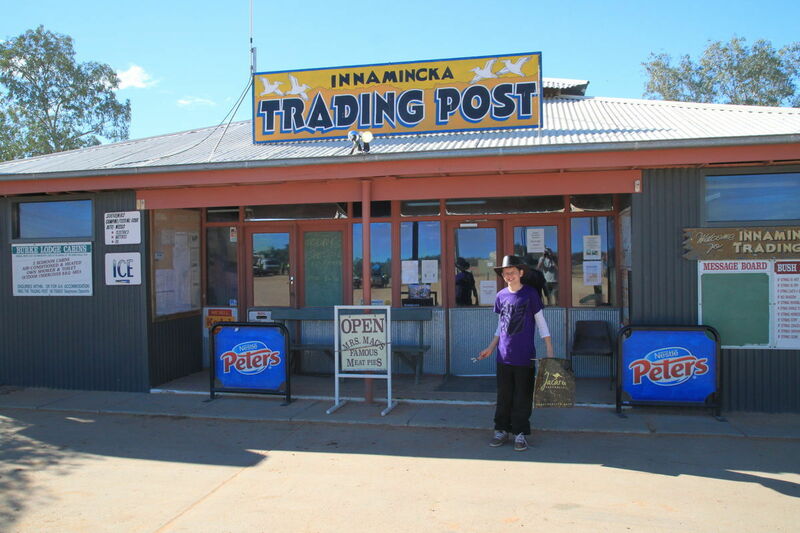 After the detour we made a short return to Innamincka before hitting the road again. 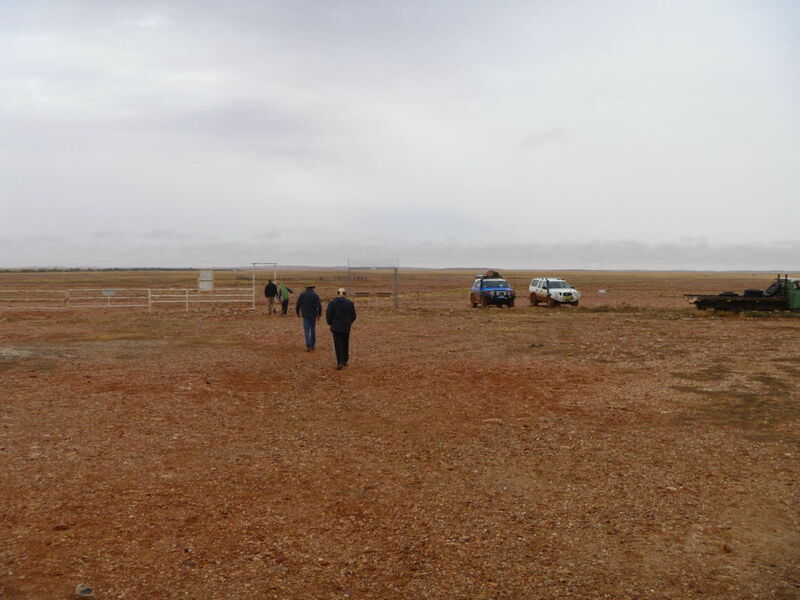 The weather was still a little unclear for the day, so we decided to take the less risky route today and dismiss our original plan of taking the Strzelecki Track and rather head West via Moomba. The road in this direction was very good and we made good time before taking a break at the Moomba gas field. 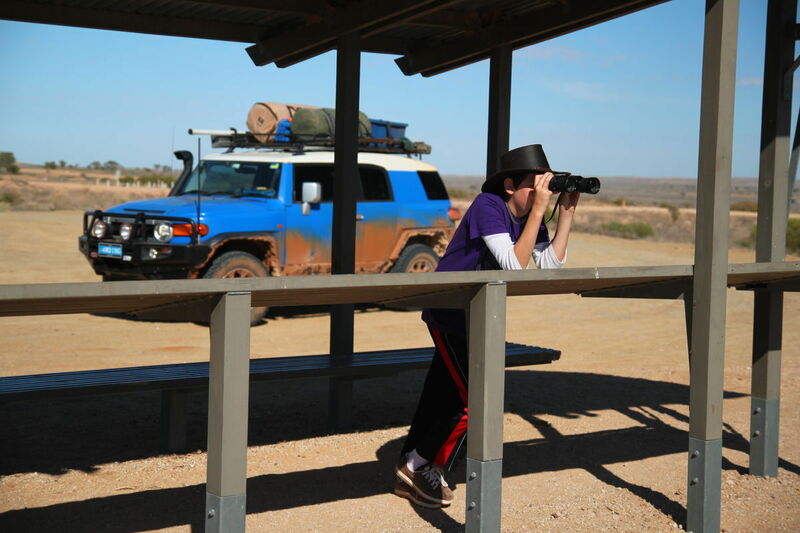 There is a nice lookout here which gives you a good view of one of the large facilities, which made for a good rest spot. 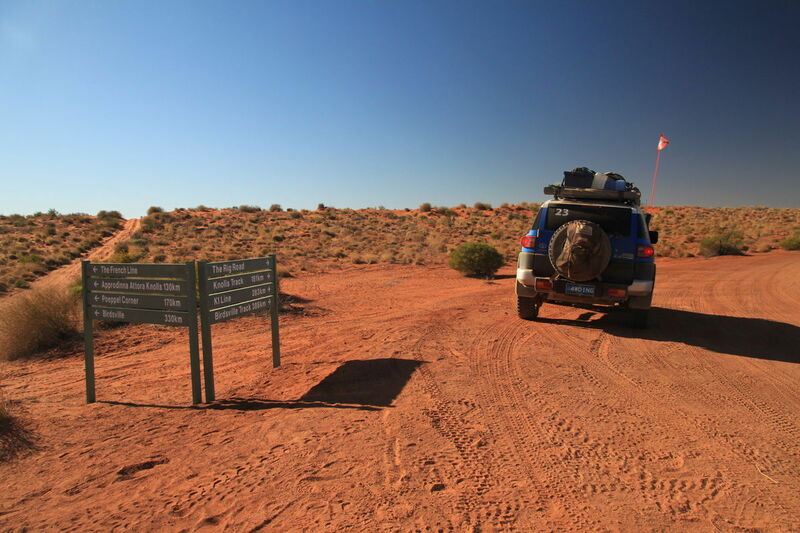 From here we headed South via Merty Merty and then continued on through the Strzelecki Desert. 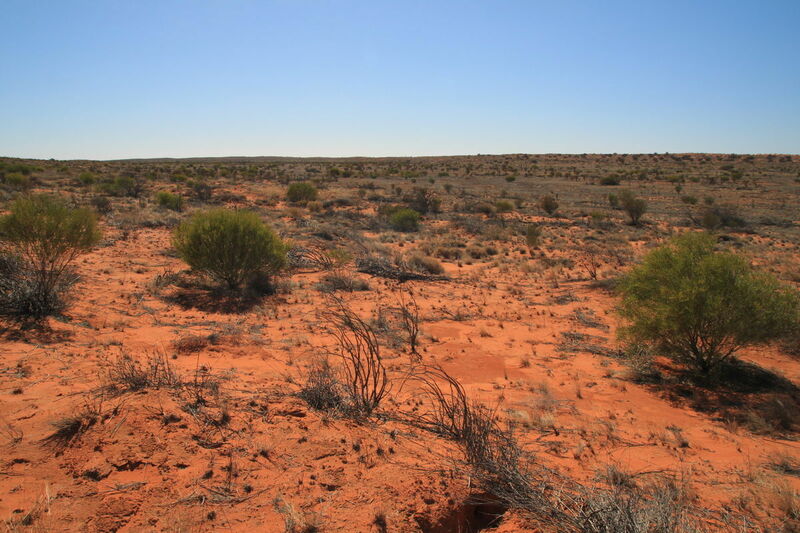 Not really a desert though, just a very large farm I think! 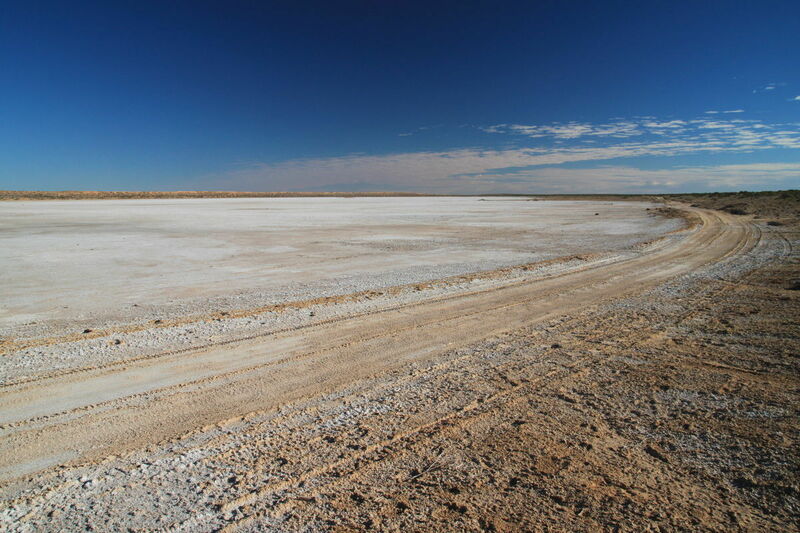 It was desolate though, with only sporadic signs of life. We passed the area on the map that indicated a "Yellow Bus" camping area, but unfortunately the bus was gone. 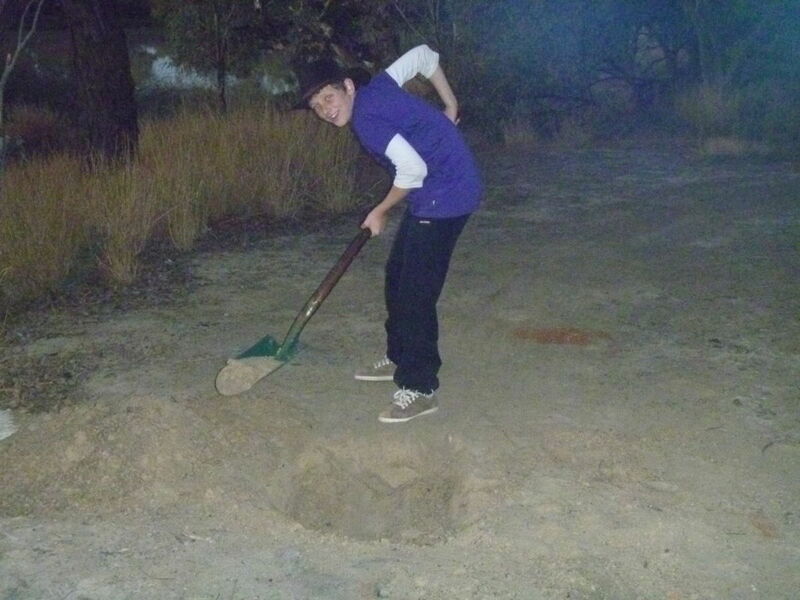 Later we found out this was due to vandals and people not camping appropriately. 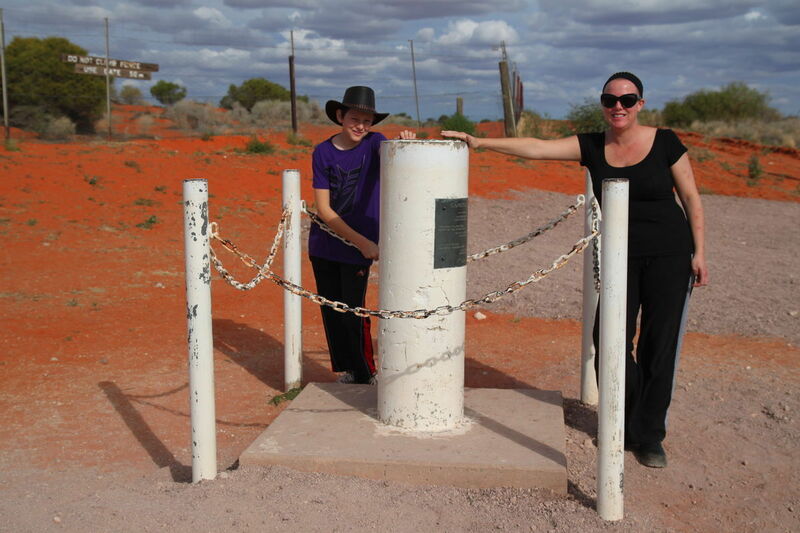 We continued East through the "jump up" country and past Bollards Lagoon before finally arriving at Cameron's Corner. 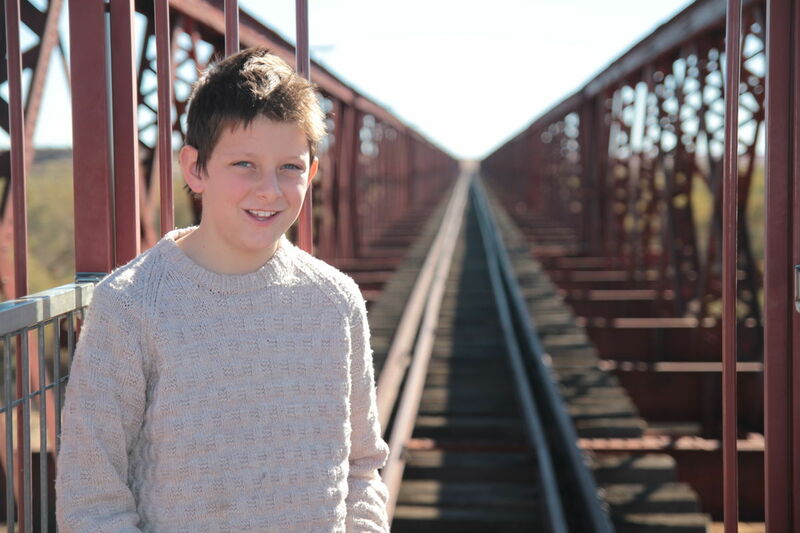 Unfortunately the "jump up" country was not a pleasant experience for Jack, but fortunately we stopped just in time to get him outside before he lost his lunch! 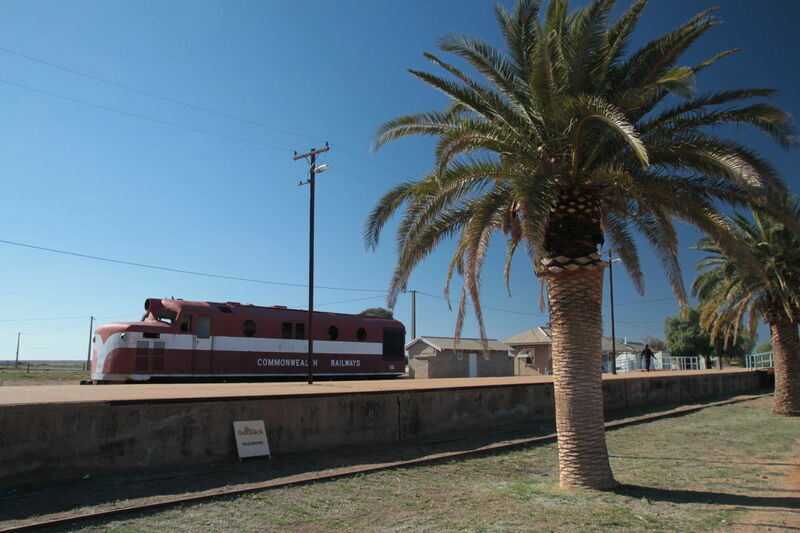 Cameron's Corner is another of those iconic locations that you have to vist. 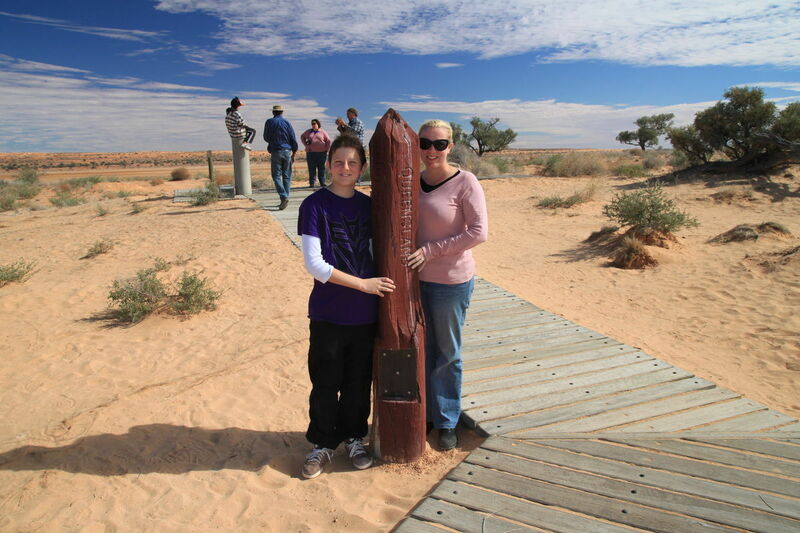 Once again we were able to stand on the border of three states, Queensland, NSW and South Australia. 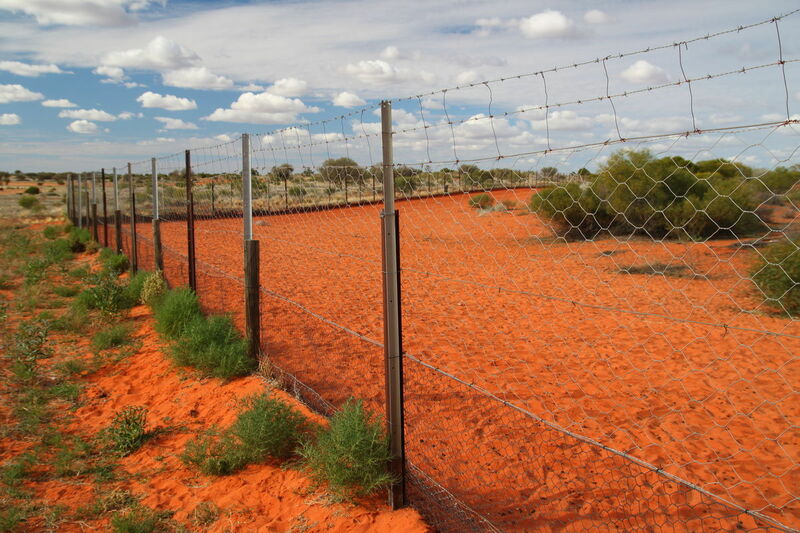 Also at this location is the Rabbit Proof Fence, or the Dog Fence, depending on how far back in history you want to go. 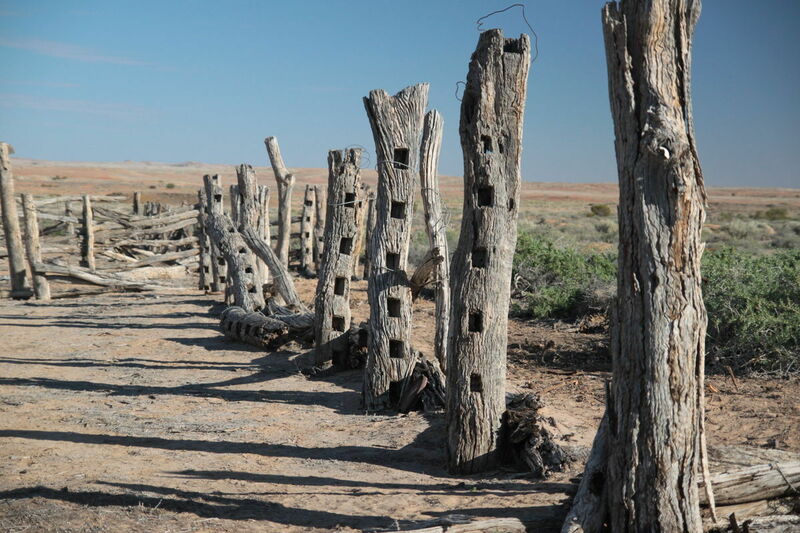 Its an impressive sight, knowing that this is the longest fence in the world! We stopped for a short while at the corner store, and found a weather and road report. It appears that the roads behind us have been slowly closing due to the bad weather. They had even closed the entry road into the desert from Dalhousie Springs! So we really did time things well, just a day or two later and we would have been seriously stuck somewhere. 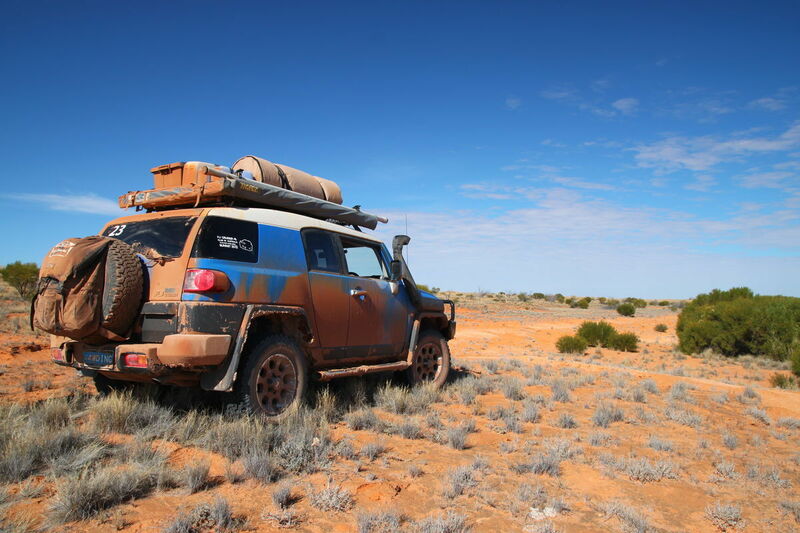 Due to the weather following quickly behind us, we made another decision to push on all the way to Tibooburra tonight to avoid getting caught up on the outback roads again in the wet. 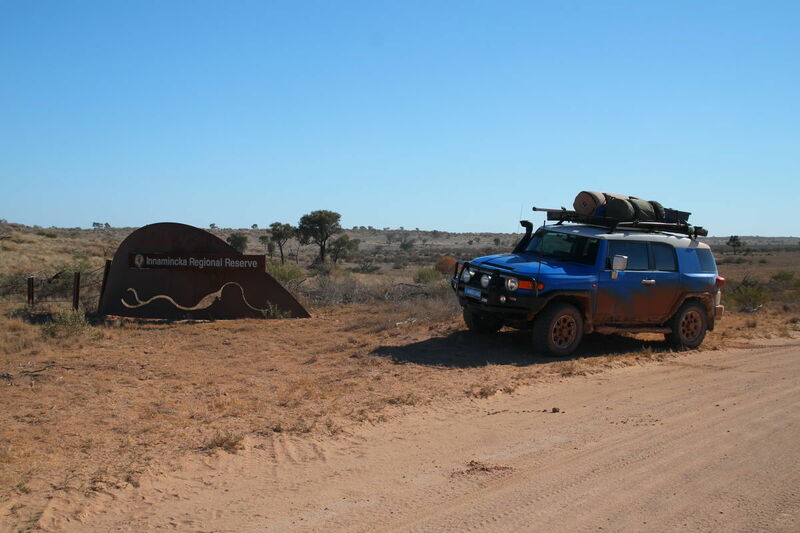 This was not a bad idea in the end, as the road from Cameron's Corner to Tibooburra would definitely have been a challenge in the wet! 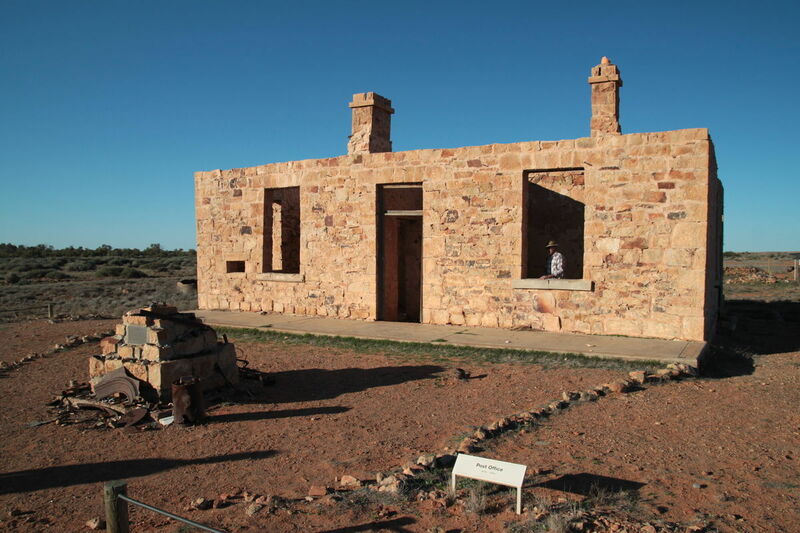 We made a short detour to check out the camping facilities at Fort Grey before continuing on to Tibooburra by early evening. 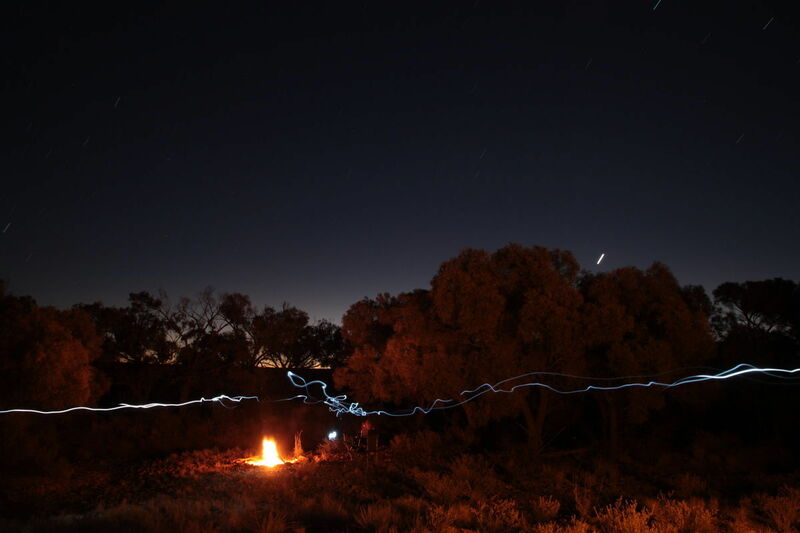 We decided to camp a little North of the town at the "Dead Horse Gap" camping area. 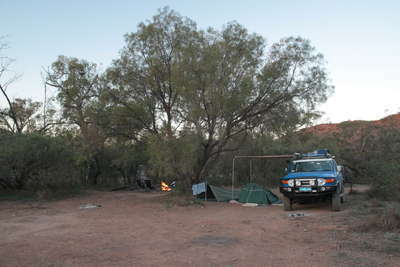 Not sure why they call it this, the camp site was great and with a toilet block! 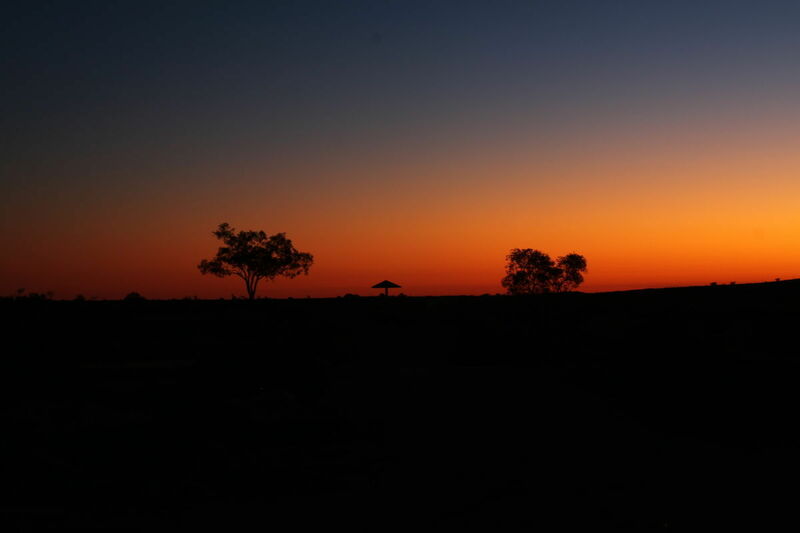 In the end the weather did not catch up with us, and we settled in for another great evening with an amazing sunset. Today was probably the first time we were thinking about heading home. We woke to another beautiful day with the sun shining and the skies clear. 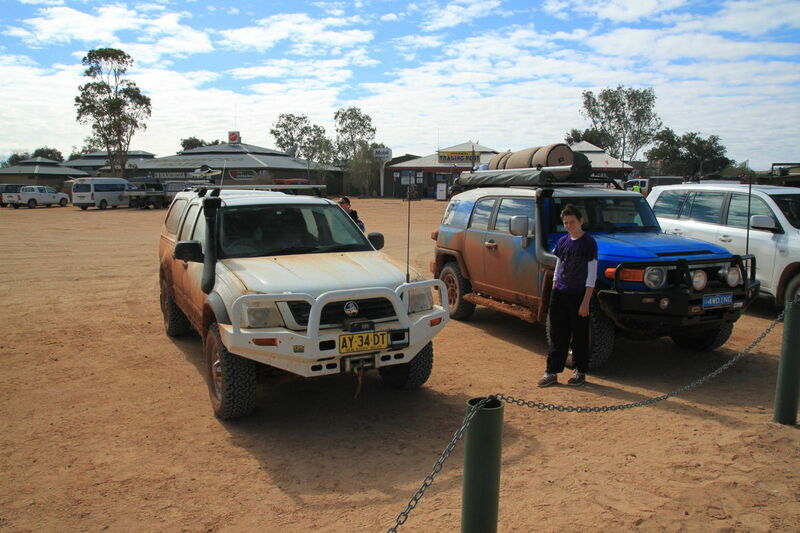 First stop with Tibooburra to put some air in the tyres and find some coffee for Sarah. With that done, we headed out of town. 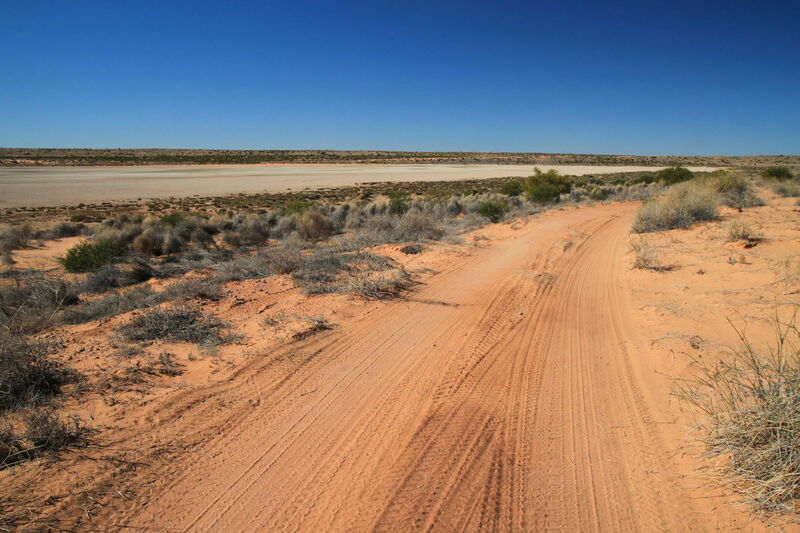 There is still a lot of dirt road to cover heading out of Tibooburra, with a lot of wildlife getting in your way! 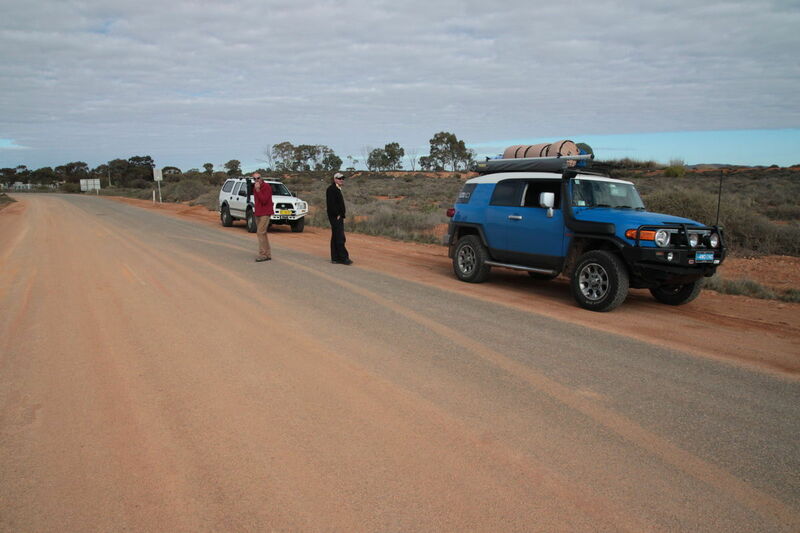 We had a number of emus try and cause us issues, fortunately we were able to avoid all of them. 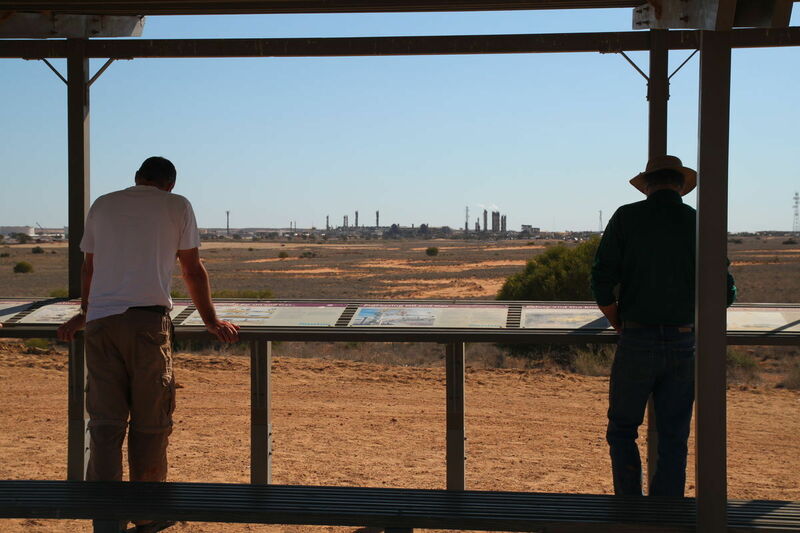 We said our farewells to Gavin and Red at the turn-off to White Cliffs as we continued our journey to the south. 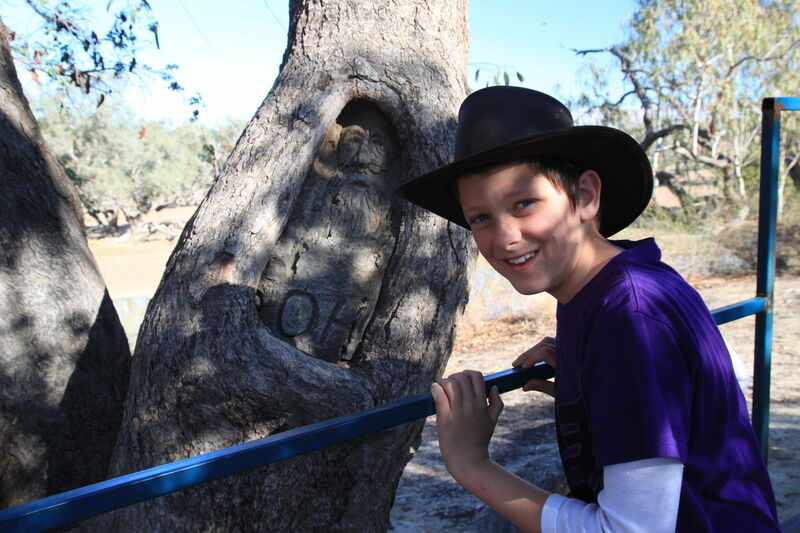 We found a great spot just south of Packsaddle to spend some time for morning tea. 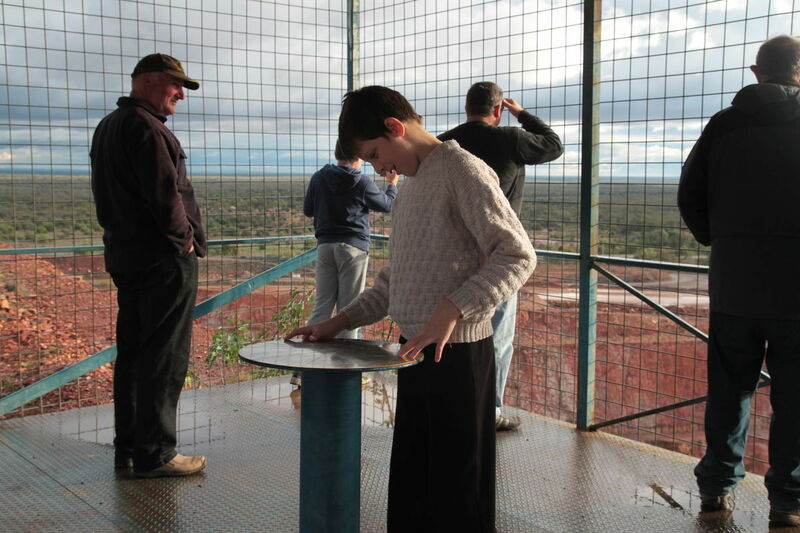 It was at the top of a radio antenna hill, looking out over the vast landscape below. 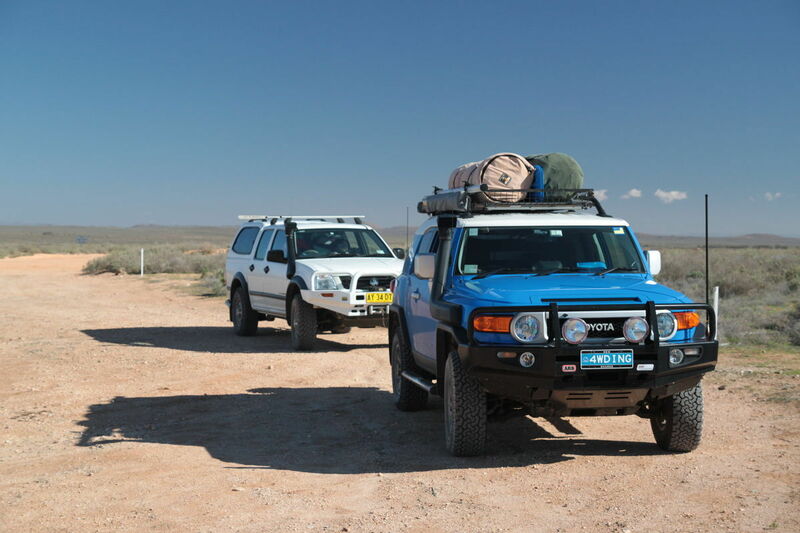 After our break we decided to just push on until we reached Broken Hill, which we managed to do by 12:30. That gave us the rest of the afternoon to explore the area a little more. First of all, I tried to get rid of some of the mud off the car - which ended up giving me some serious wheel balance issues! 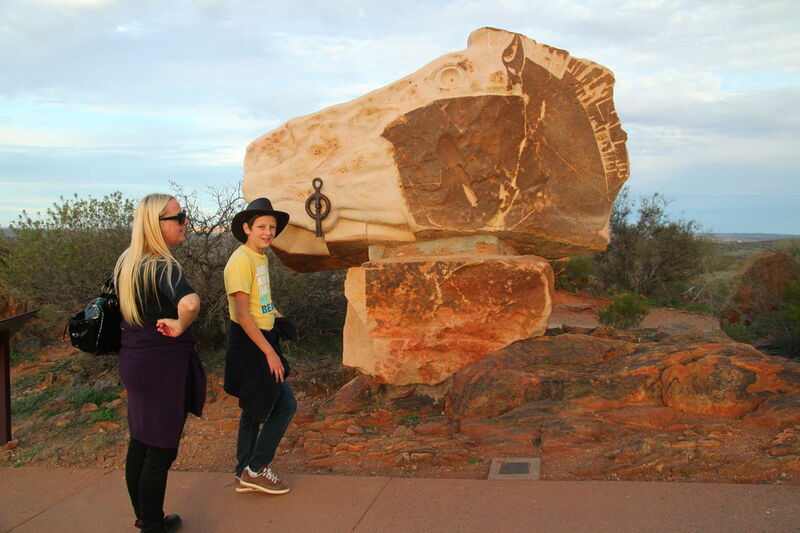 We then drove around to find the miners memorial overlooking the town, before heading to the amazing sculptures in the living desert which is just to the North of Broken Hill. 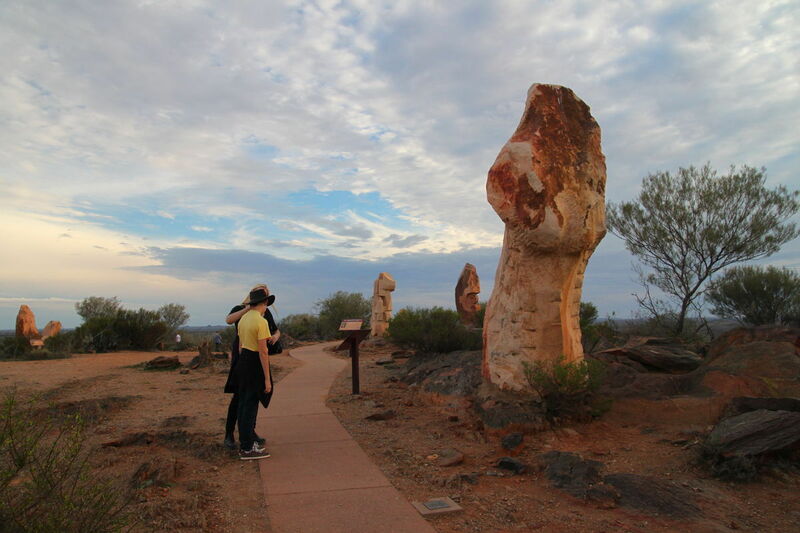 We took the long walking trail to the sculptures, since we had spent so much time sitting in the car the walk did us good! We reached the top of the hill at the perfect time with the sun just starting to set. 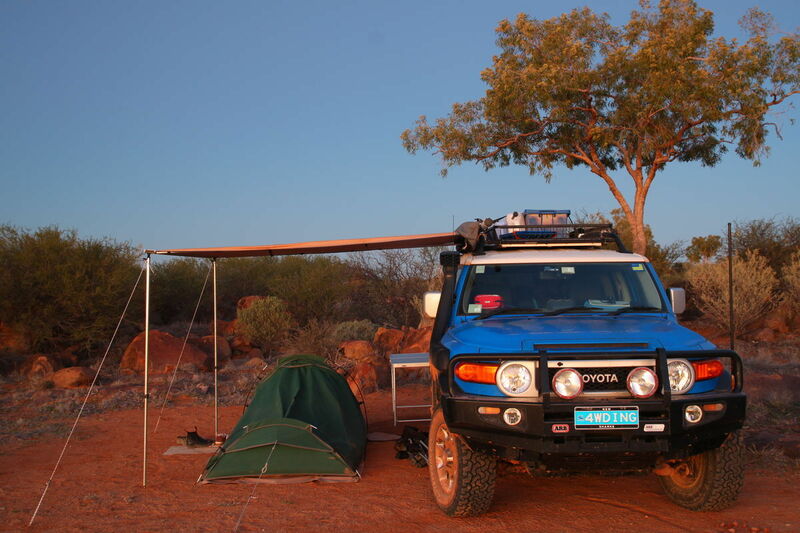 After that, it was back to base camp and out for another amazing dinner - they make good food out here! And then, back to a real bed. 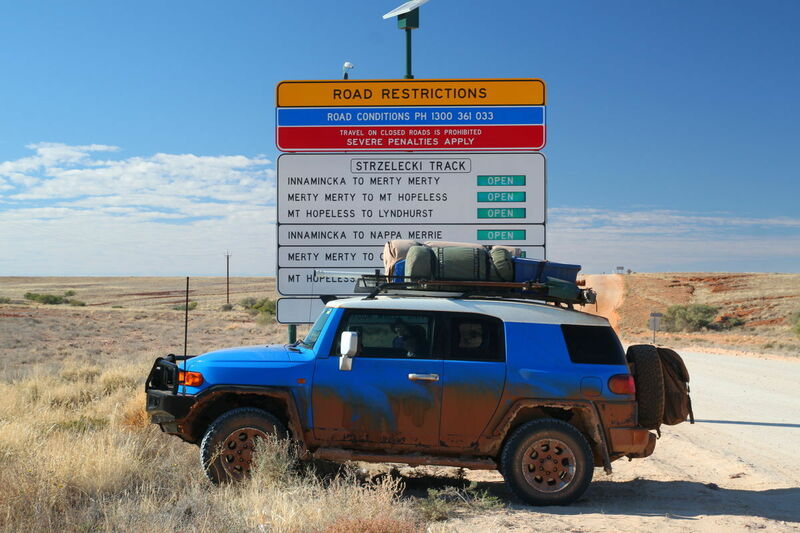 Not really too much to report about the final couple of legs to get home - other than the fact that its a long long drive from Broken Hill to home!